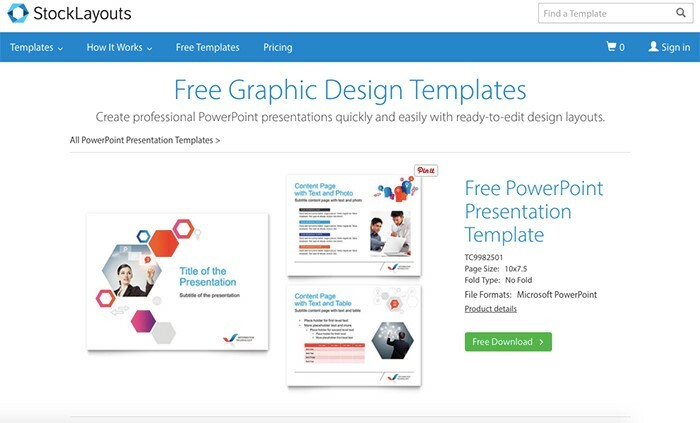 In this post, you will find the best free Powerpoint templates to build professional presentations in less time. 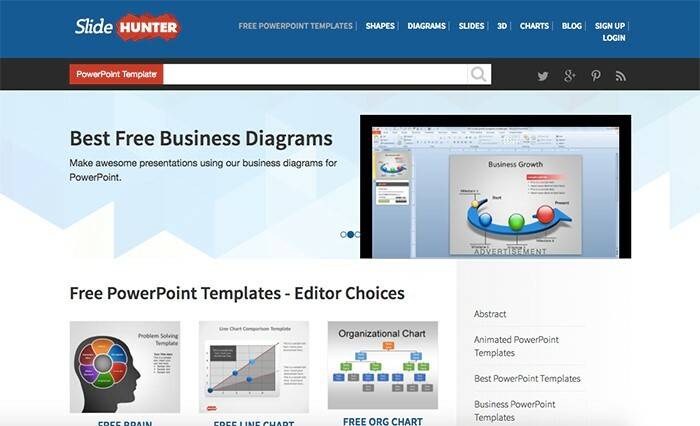 Whether for business or educational these PPT templates will do the job. Talking about presentation software, PowerPoint is the very first thing to mention. 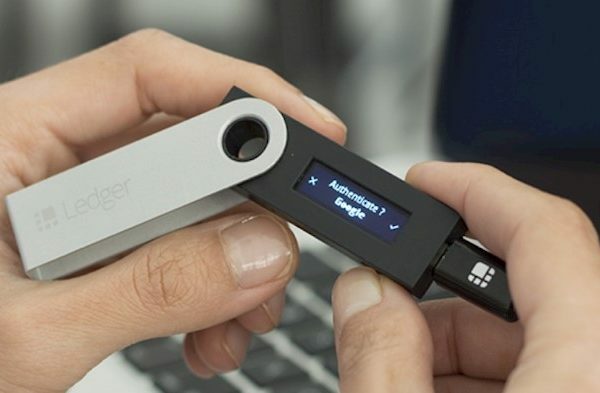 We know this program for ages, and every update brings new features expanding its possibilities. These days you can create almost any slide and elements, use any font and image in PowerPoint for Windows or Mac. 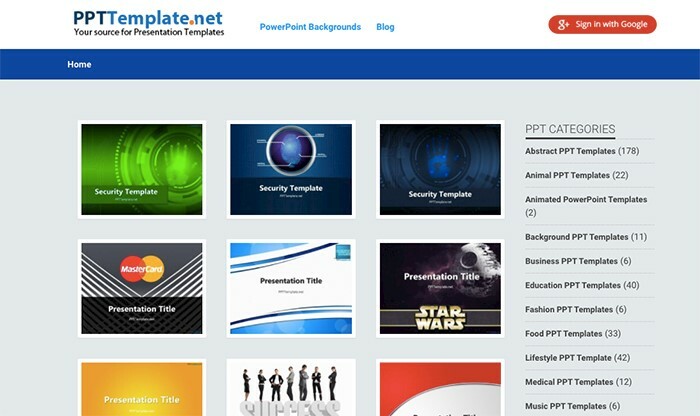 The web is full of both premium and free PowerPoint templates you can download or buy today. However, most sites sell the templates at high prices which is no good for low budget projects. 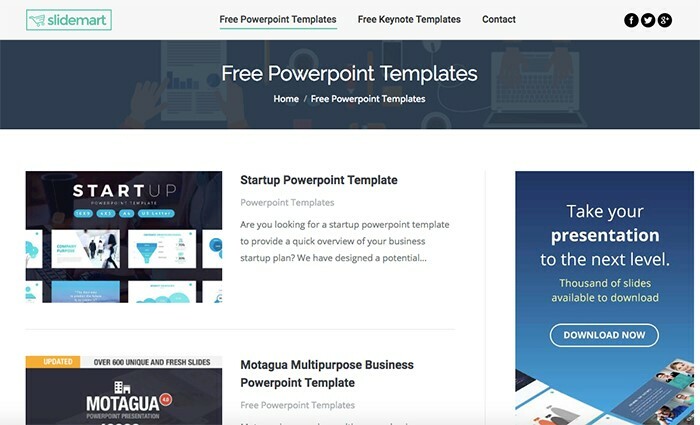 For those of you who are looking for free presentation templates, we have collected the best PPT templates you can download to create amazing presentations. 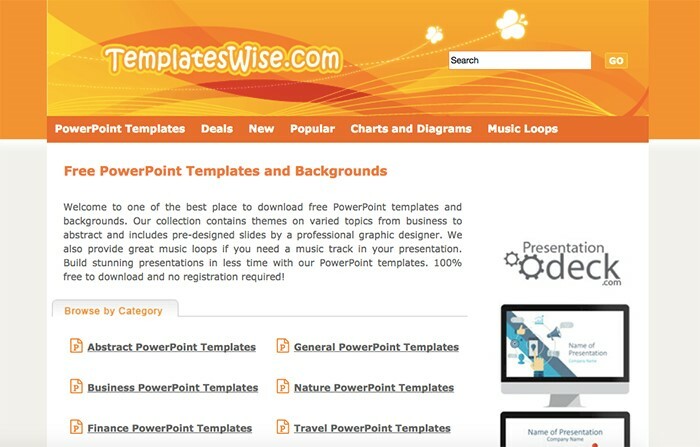 In addition, we featured some of the best sites to download PowerPoint templates. 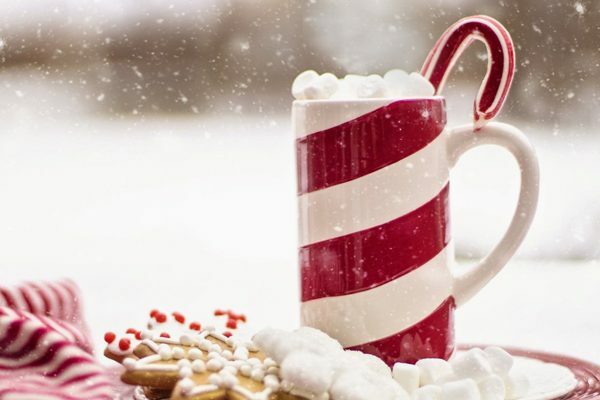 Why stress in trying to create a sophisticated and cultivated presentation, when the perfect presentation for you has already been created for you? 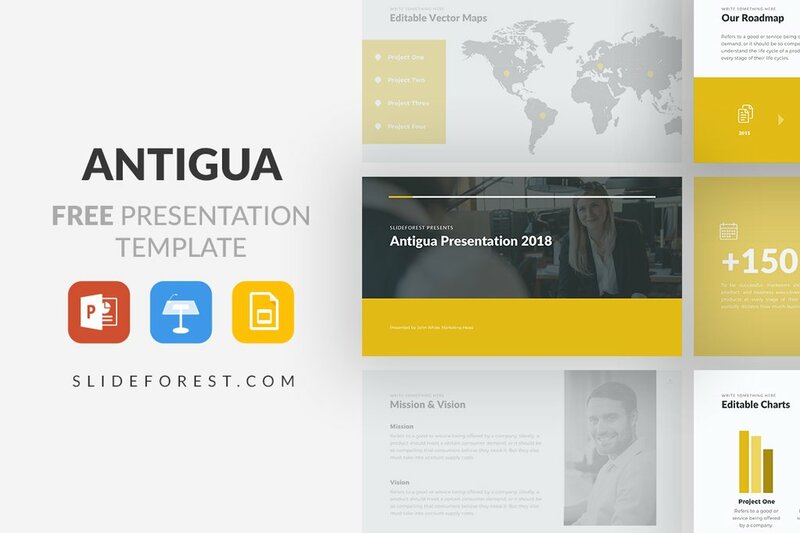 Antigua Free Presentation Template has an elegant and professional look that will leave a lasting impression on your audience. 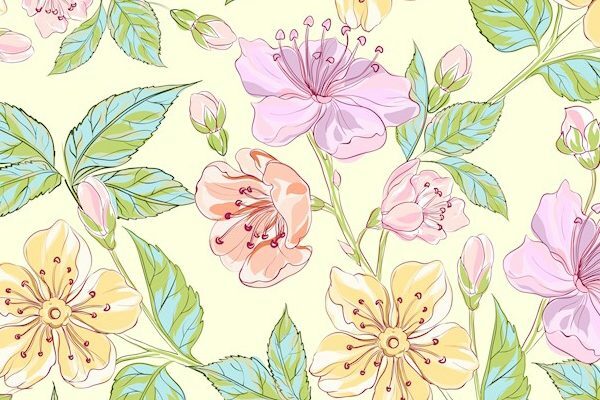 This template is easy to edit, has high-quality graphics, and it is free for you to use. This presentation uses a bright yellow color to make each slide stand out, while not causing much of a distraction to make your audience lose their focus on your presentation. If the color yellow is not your color, or you would like the color to match your company’s theme, then you can easily change the color with a click of a few buttons. Slideforest offers professional Powerpoint templates you can get to create stunning presentations. 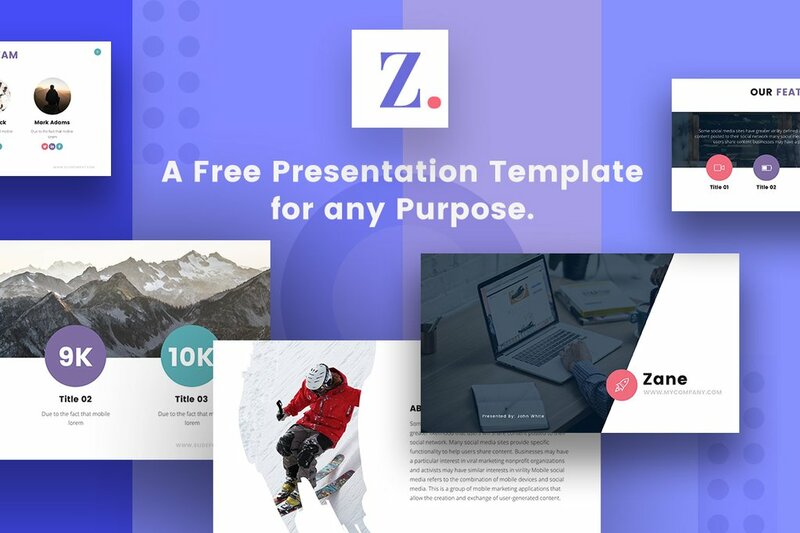 If you want an impressive presentation template that is modern and will capture your audience’s attention, then use Zane to deliver an outstanding presentation. 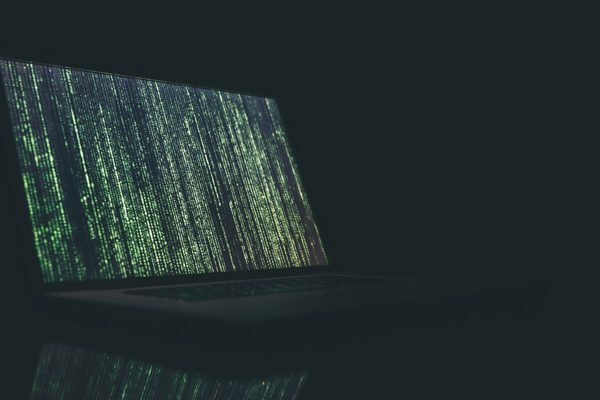 Even though this presentation only contains 11 slides, you can easily edit them and organize your information in many different ways to present to your audience all the information they need to know. In fact, you can change the color of the presentation with a click of a button that would better suit your presentation. Because having to give a presentation, get all the information together, and organize it in an appropriately is difficult to do, this presentation was designed to make it easier for you to be able to get all the information you need to your audience without all the stress. 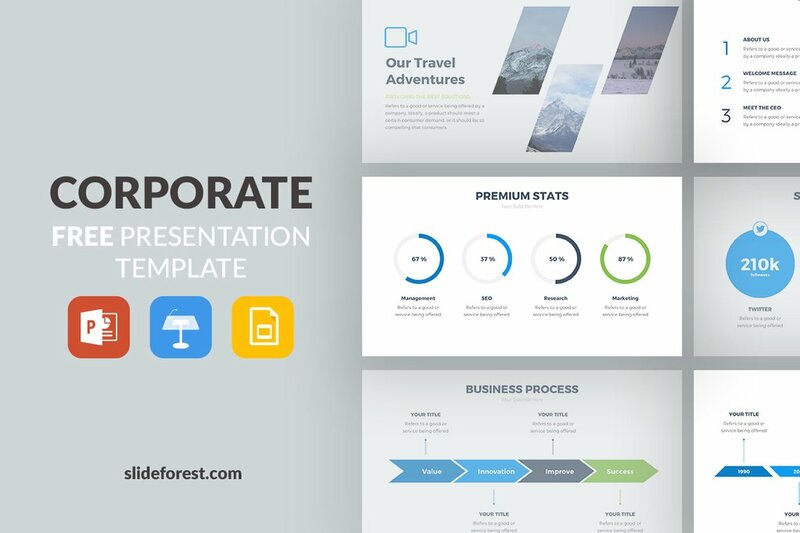 If you want a presentation template that is elegant, modern, and professional, then use the Corporate Free Presentation Template. Corporate is composed of 8 organized and clean slides that are easy to edit. All the slides have graphic designs of high-quality, making this presentation appealing with its subtle use of cool and fresh colors. This presentation is perfect for a business presentation on a new pitch, report, etc. Give a presentation that will show your confidence and what you are capable of doing. Because of its high-quality graphics and easy to edit slides, you can make the presentation that will best match with your companies expectations and show how well you can represent them. 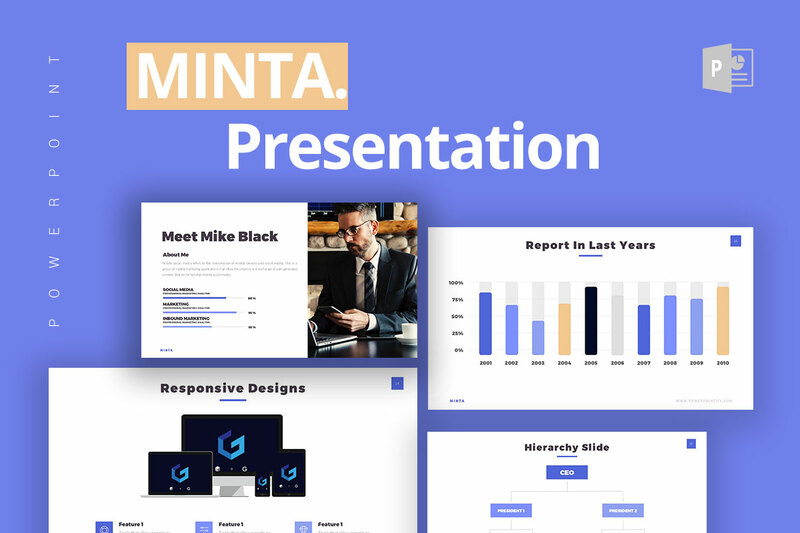 Minta Free Powerpoint Template is a clean, organized, and professional presentation template that will make your information stand out, and capture your audience’s attention. 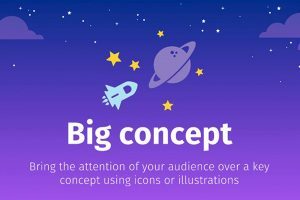 You can add images, infographics, and use icons throughout the presentation to make it visually appealing, instead of having slides of just words for the audience to look at. You can add infographics to help explain data, in fact, it could even be beneficial to help those in your audience who are visual learners. Similarly, you can add images, because an image is worth a thousand words. 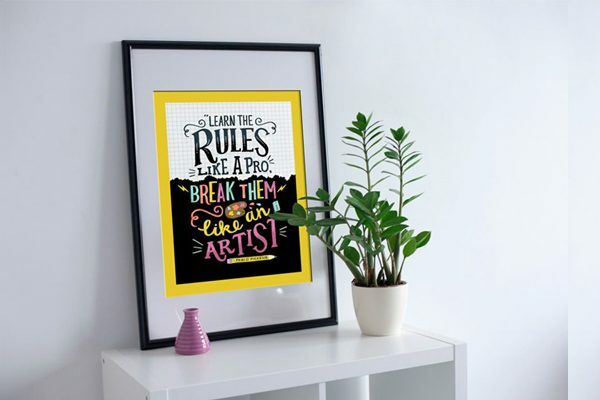 Using simple images and infographics will give the audience something more other than words to look at, which would then lead to them giving you their undivided attention. For an elegant and informative presentation that looks professional use the Business Gold Powerpoint Template. Because of its clean and organized layout, this presentation is sure to impress and give your audience a clear message they can understand. 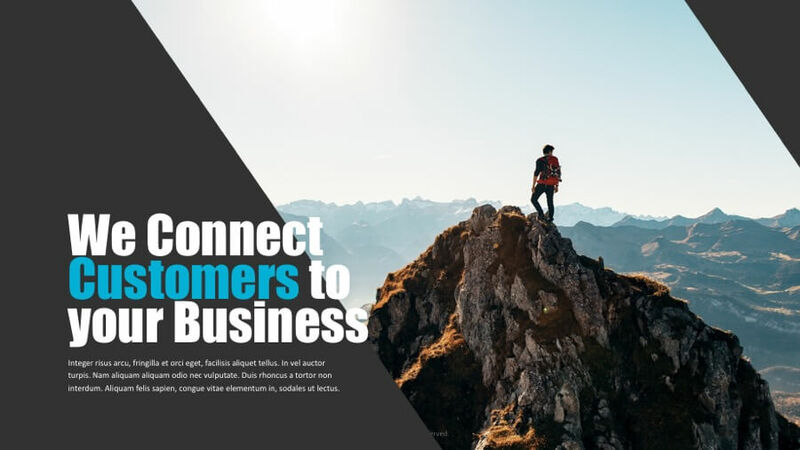 Business Gold is composed of 20 easy and fully editable slides to make your presentation unique and stand out. Since this is your presentation, each slide is easy and ready for you to customize. So, don’t settle for any presentation, but stand out using this Powerpoint template that with its use of Gold makes any presentation look elegant while also giving it a classy and sophisticated look. As a result, you will impress your audience, while showing them your determination and creativity. 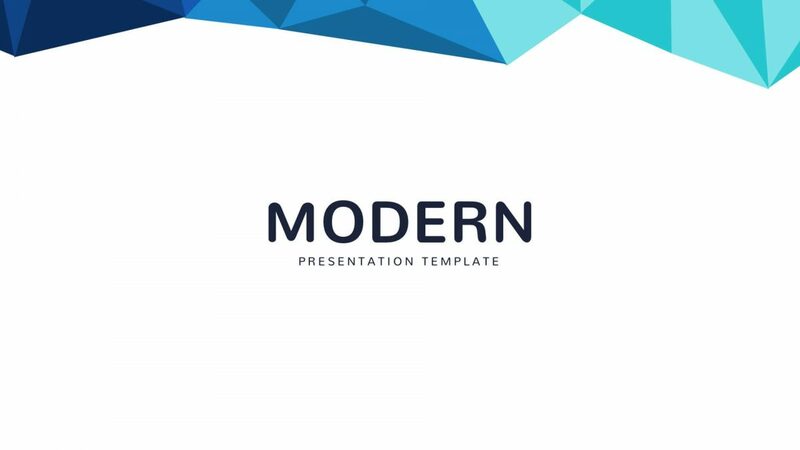 For a modern and simple presentation that is both creative and multipurpose use the Modern Minimal Powerpoint Template. This presentation is colorful and a very creative way to display information to an audience. 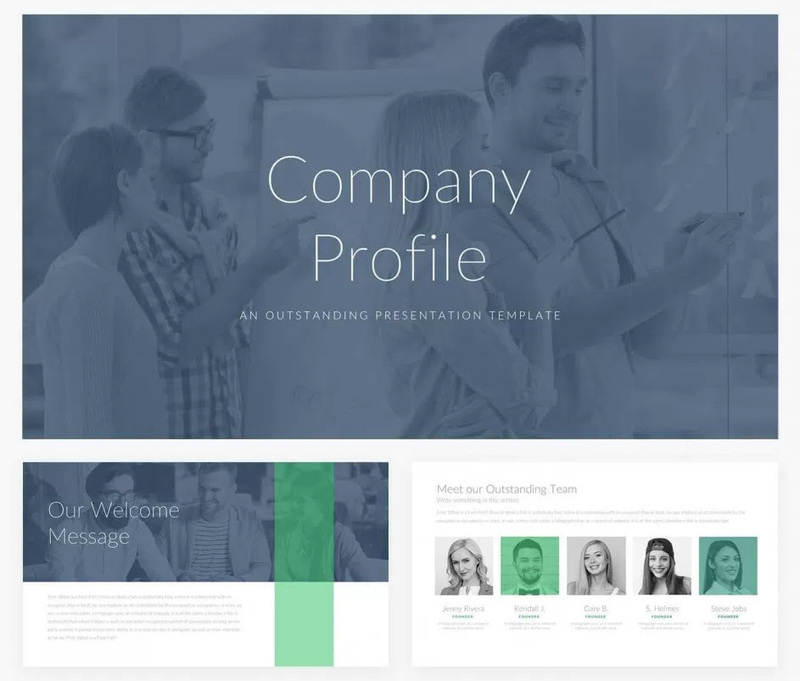 This template contains more than 30 slides, which you can add, delete, and rearrange anything on the layout. In fact, you have full control on the slides to have them look and present your information however you want. 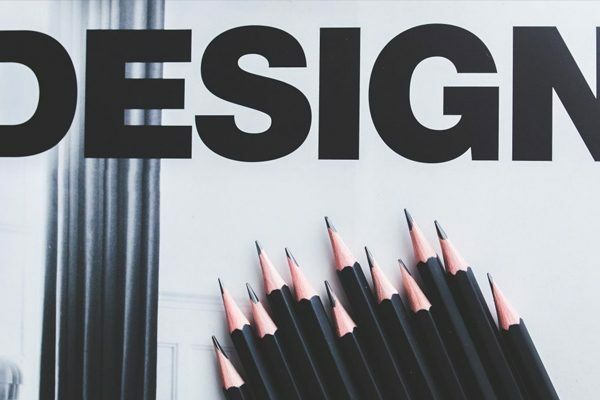 To make it more visually appealing than it already is, you can add images, infographics, and icons to give the audience a little more to look at than words on a screen. 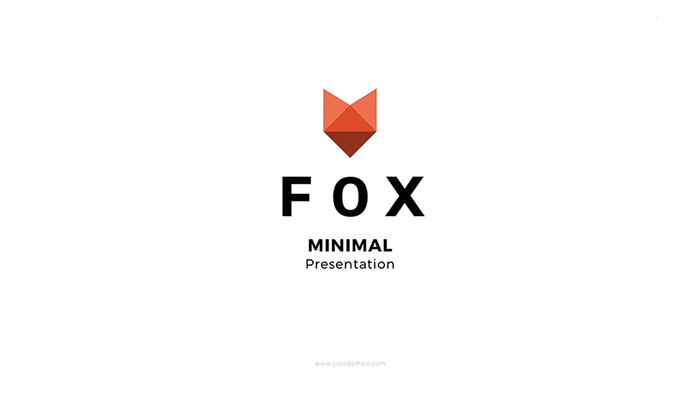 If you want to leave a lasting impression on your audience, then download Modern Minimal for your next presentation. For a fresh look, Organic Powerpoint Template should be your presentation’s weapon, to not only capture, but also impress your audience. 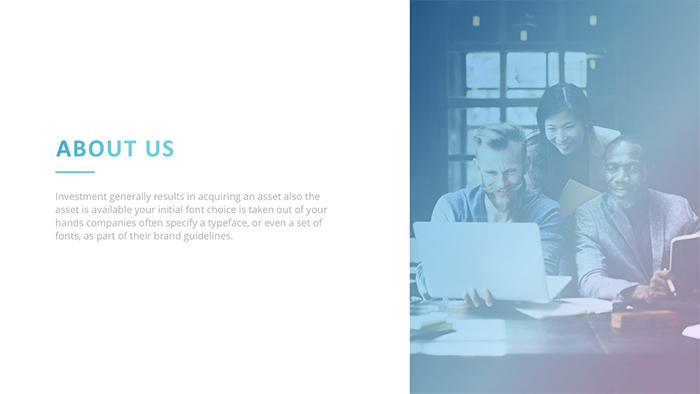 This template is modern and clean, giving your presentation a calming vibe. Some of the slides contain a unique pattern that makes it stand out with its creativity. In addition, the green used with the white background helps information stand out and make all your information be eye-catching. 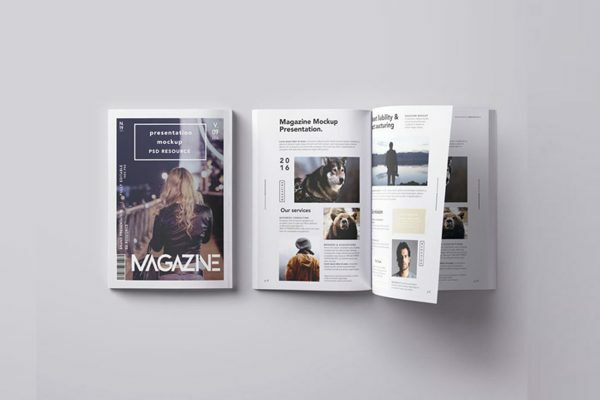 So, don’t settle for any presentation template, with Organic you have full control over how you want your information organized and presented. All you mostly have to worry about is gathering all the information you need to present, and simply add it to the template. 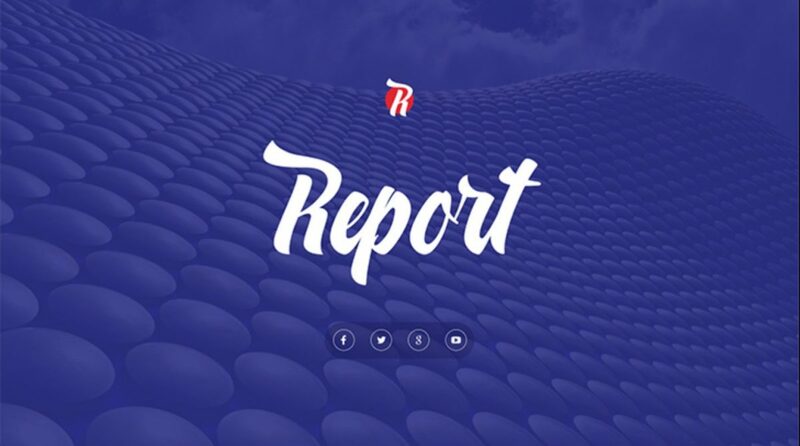 The Report Powerpoint Template is a well-organized presentation template that uses color to enhance the audience’s attention. The cool electric colors used in this presentation will give a unique and modern look to your project. This presentation could be used for a school report, business report, or any other project, there is not just one use for this presentation. The 15 slides that make up this presentation can be easily edited for you to organize your information on how you want to present it. 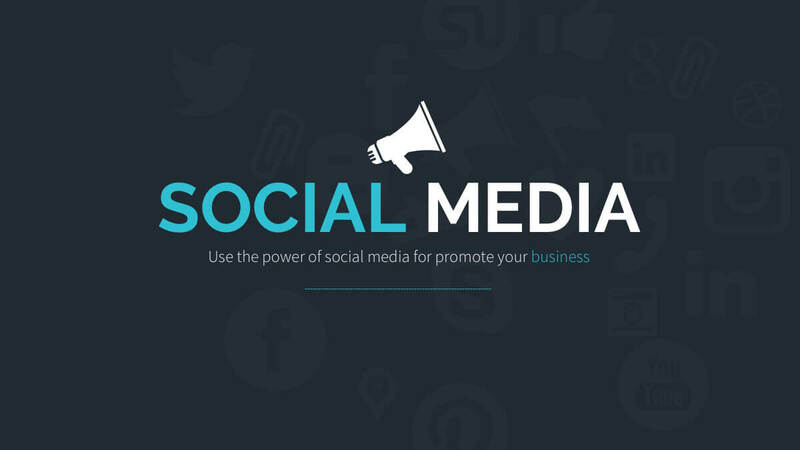 In addition, you can add images, infographics, and icons to visually attract the audience. As a result, you will have the audience’s undivided attention, and they will have a clear understanding of what you discussed in your presentation. 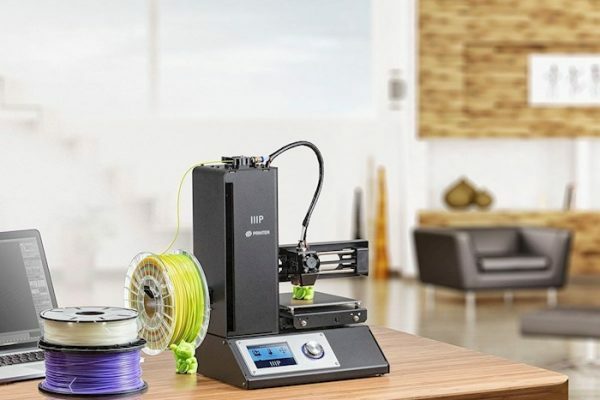 Want your project to stand out? Using the Marketing Plan Powerpoint Template you will impress your audience using a modern and colorful presentation. As a result, your audience will be focused and not daydream. 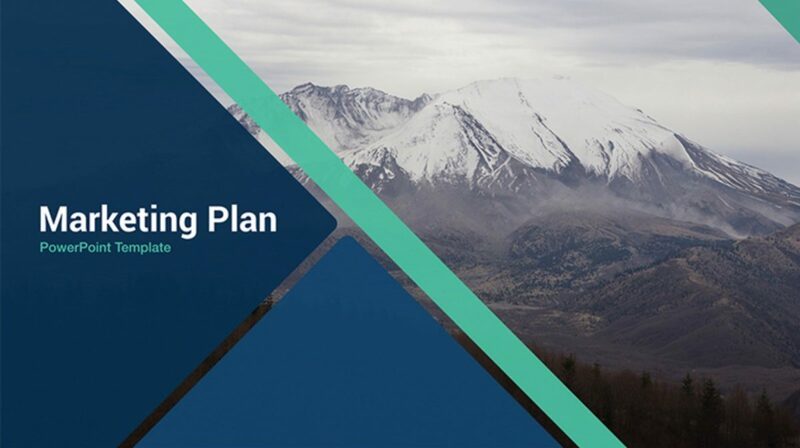 Marketing Plan is composed of 26 simple slides, comes with 5 different pre-made colors, and is fully editable for you to create a visually appealing presentation. You can add infographics, images, and icons in order to give the audience a little more than just words to look at. Having those visual aids helps people who are visual learners get a better understanding of what you have discussed. 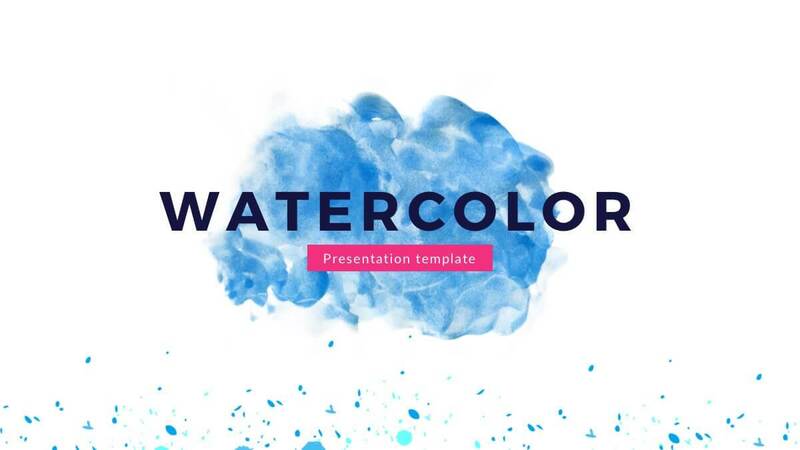 Watercolor Powerpoint Template is a creative and expressive presentation. The colors used are not distracting, but visually enticing to capture your audience’s attention. The slide layouts are clean and simple, making it easier to follow along and give your listeners a clear message. Since the color is nice and bright, this presentation gives a positive vibe, while not being overwhelming and leaving the audience with a calm feeling with its minimal style. 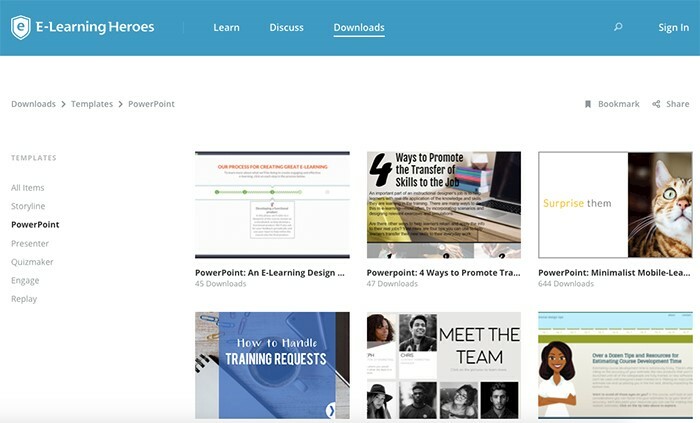 With this presentation, you have 25 unique slides that are fully editable and ready for you to use. 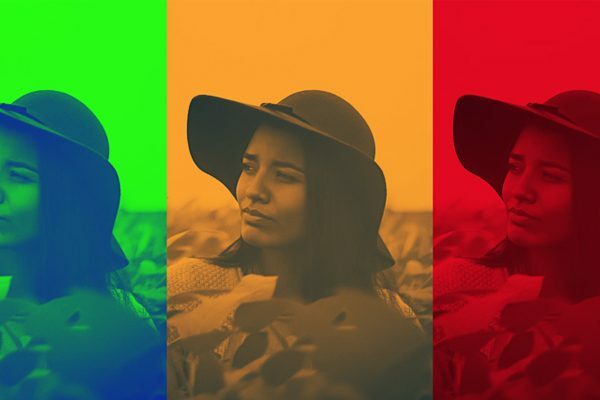 Don’t settle with a normal black and white presentation, on the contrary, enlighten your audience with this colorful and artful presentation that will have anyone hooked. Seattle has a clean and creative style, great for a presentation to be demonstrated to a business, company, or to use for personal purposes. This elegant presentation come with two versions, depending on how you want to present your information, you can present it in a dark version or a light version. In addition, you can also change the scheme to match your company’s theme or topic theme. With Seattle, you are provided with 6 different color schemes to create the presentation you like. You have an infinite amount of way to organize your information, to better present to the audience how you feel is best. So don’t settle for a boring presentation when this one is created just for you, and it is ready to use. 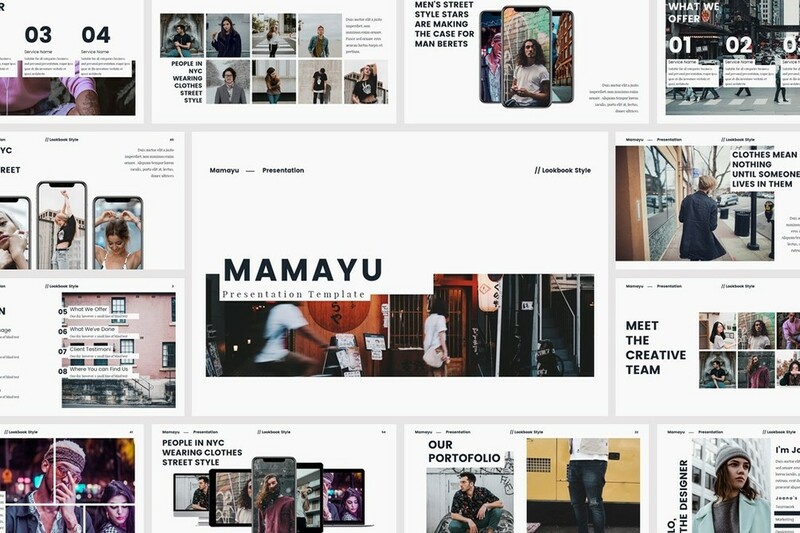 Mamayu is a creative and beautiful presentation template that has a lookbook style for you to add images. 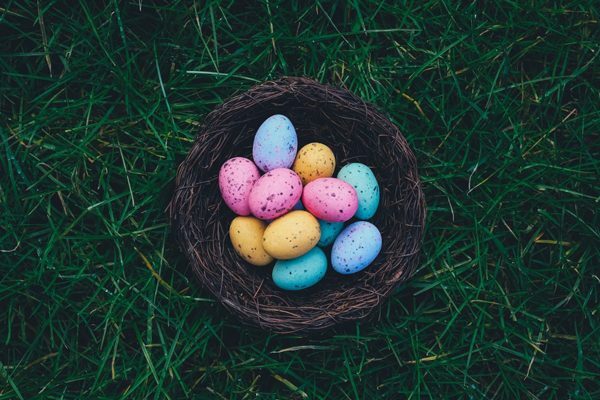 Don’t be like everyone else, rather stand out and create a presentation that will capture your audiences, with its clean and visually appealing layout. You can add minimal information to each slide, and just let your images to the talking, since an image is worth a thousand words. This is a unique presentation that will impress your audience, and leave a lasting impression of what you are capable of doing. You do not need to write a long and detailed paragraph to explain a point to an audience, sometimes adding images and keeping your information short, sweet, and to the point may be an effective way to come across to an audience. 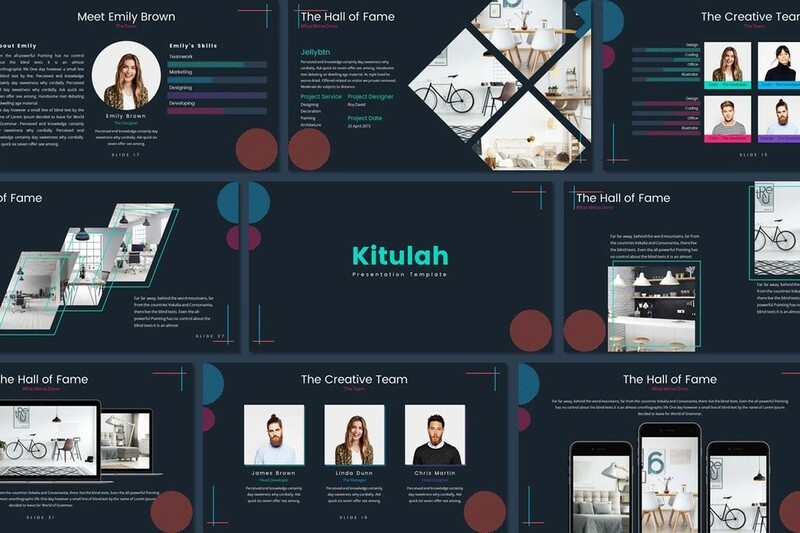 This colorful and creative presentation template will not only visually capture your audience’s attention but will impress you with how easy it is to create a professional and creative presentation. Kitulah is not like any other presentation. This presentation template is organized, and uses various colors, to create the perfect color combination that is easy to read and understand with the dark background. Even though the background is dark, the colors stand out beautifully, wowing your audience. All the template have a unique and distinctive layout to give you an unlimited amount of ways to organize your information how you feel will be better presented. An eye-catching presentation template that will keep your audience focused is the Onyx Powerpoint Template. 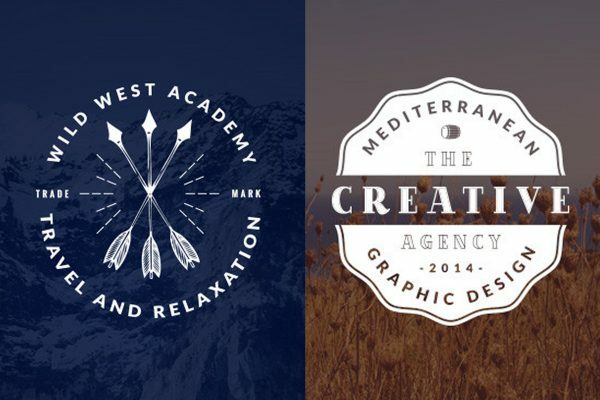 This modern, bi-colored template has a clean layout that is organized and visually appealing. The main colors used throughout this presentation are blue and orange, but that can easily be changed with a click of a button. 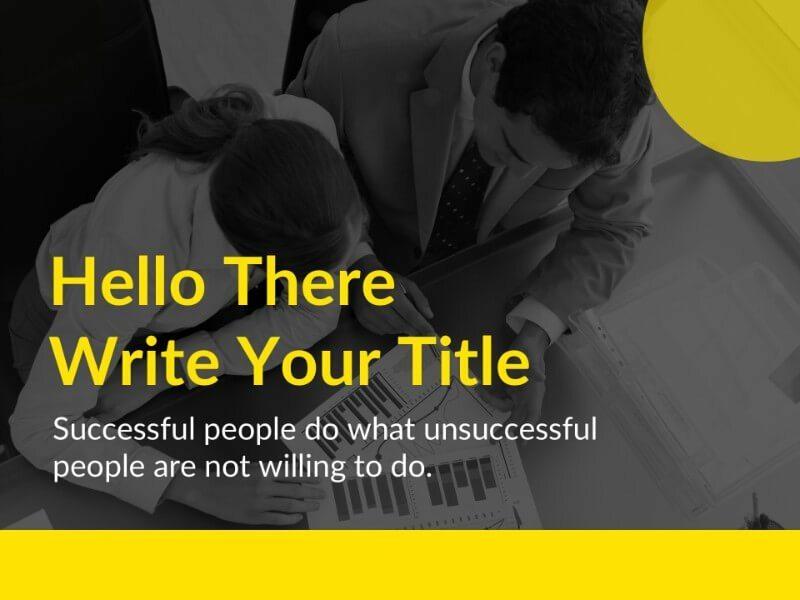 Wow, your audience with this creative presentation template. Onyx lets you add anything you need in order to give your audience a clear understanding of what you are discussing, could be through images or infographics. You could also capture your audience’s attention to focus on important information using icons the template provides for you. Let’s talk business. 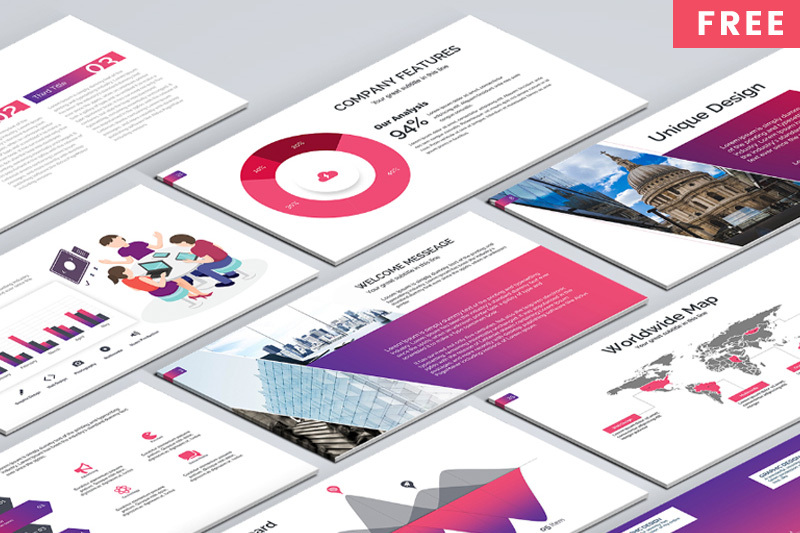 The Business Powerpoint Template is a modern and professional presentation template that uses color to make important information stand out. There are unlimited ways for you to organize the information, letting you get creative and give an impressive presentation. Even though there are only 10 slides, you can easily customize the presentation in an unlimited amount ways, to impress your audience. You can also use infographics and images to make it more visually appealing. The colors used are cool and natural colors that stand out beautifully with the white backgrounds, but if you do not like the color, that could be changed with a click of a few buttons. With the Elite Powerpoint Template, it does not matter if you are a small company or a huge corporate, this presentation will deliver a professional and impressive presentation making you stand out. It is laid out in a clean and organized manner to deliver your message successfully. 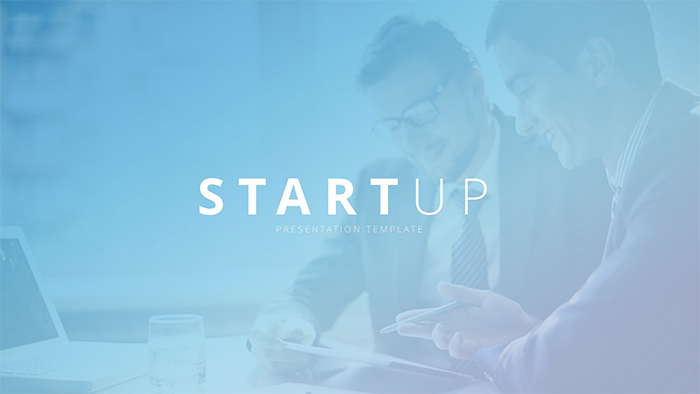 This presentation template is great for a business pitch, company report, or any professional presentation. 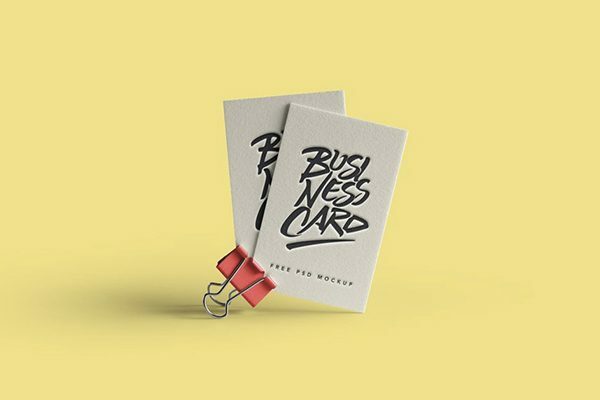 The color yellow is used to give the presentation a more visually appealing look while making each slide stand out, if you want to use a color to match with your company’s theme or color, you can change the color with no difficulty. In addition, you are able to add images and infographics to add more visuals to your presentation. 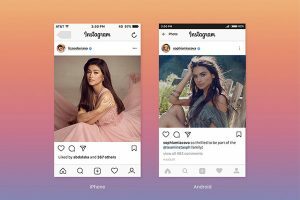 Instagram is a popular social media that is used mostly by everyone, which is why the Instagram Analysis Powerpoint Template was designed. This clean and colorful presentation will capture everyone’s attention with its unique color scheme. Since the colors used are iconic and a well-known color combination, people will be intrigued by your presentation. So, stand out and make a lasting impression with your presentation. Use this colorful presentation template to enhance your audience attention and show them how creative you are. In fact, using this presentation should make you feel confident because everyone will be focused on what you have to say. When you look out at your audience, no one will be daydreaming or be getting distracted, because they will have your undivided attention. 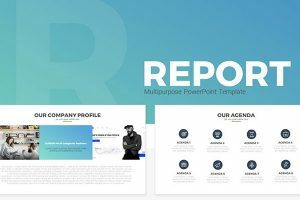 The Company Profile Pro Powerpoint Template is an outstanding and modern presentation template that will astonish your audience. Giving a business presentation, school project, or company report has never more exciting and interesting. The use of bright orange, which is associated with determination and success, gives your presentation a visually appealing look. As a result, you will get your audience’s undivided attention. 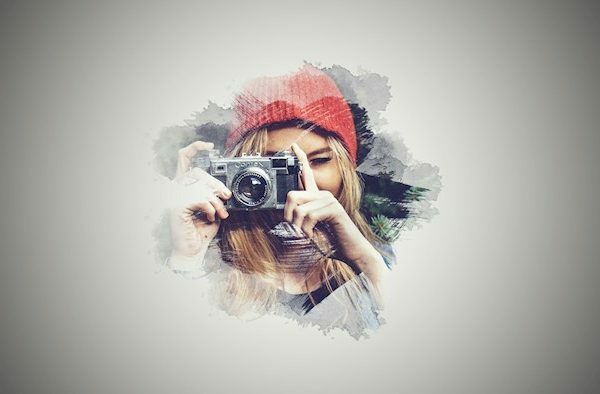 Don’t struggle to create an impressive presentation because the Company Profile will not only impress your audience, but it will also impress you with how simple it is edit and customize. You don’t have to spend hours trying to figure out where to start. 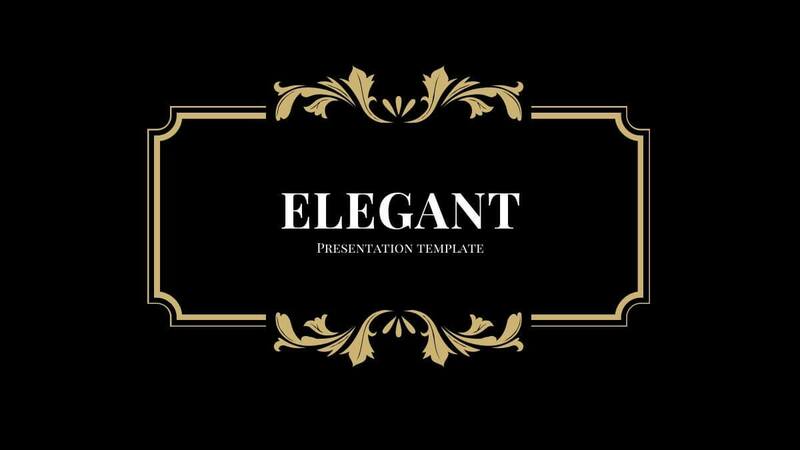 Elegant Powerpoint Template has a classy and sophisticated look. This Powerpoint template is unique and will impress your audience with its stylish and chic design. Don’t stress about trying to create the perfect presentation template, when it has already been designed for you. 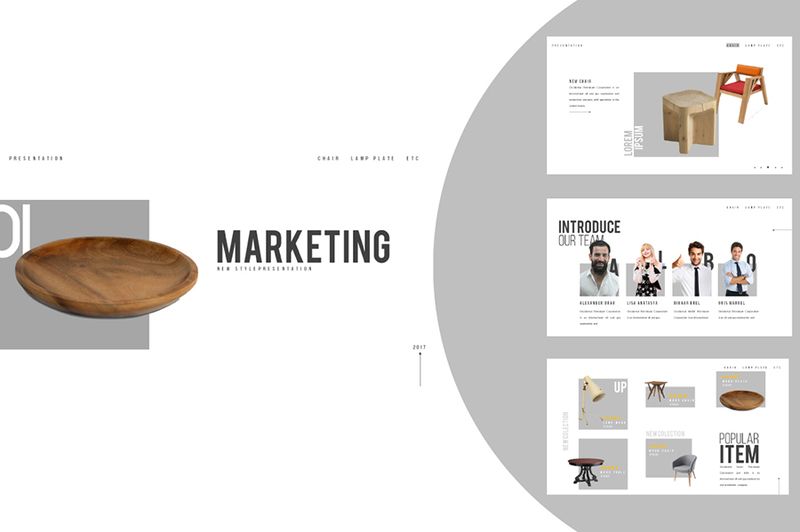 This template is perfect for any fancy presentation, like a business on fashion, retail, designing, wedding planning, etc. Don’t just settle for a simple presentation, when you can present with elegance. In addition, you can add anything you need to make this presentation more visually appealing like adding infographics and images. Adding images gives the audience something other than words to look at, while the infographics are the best way to represent data. If you want a minimal and multi-purpose presentation, then the perfect presentation template for you would be the Nova Powerpoint Template. Nova has a modern design that is clean and organized. 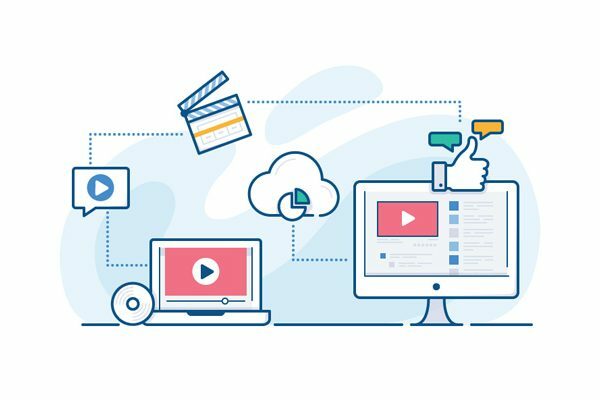 As a result, you will impress your audience with this unique presentation with its unique and high- quality design. Since this presentation has a minimal look, it will represent you with confidence and show the ambition you have. In fact, this presentation will also keep you from overwhelming your audience with adding too much information on the slide. One of the best ways to make sure you don’t lose your audience’s focus is by keeping your slides short, sweet, and to the point. 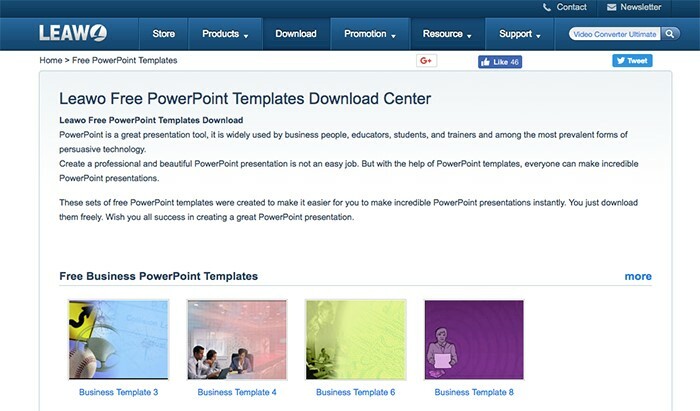 Impress your audience using the Bizplan Powerpoint Template. This Powerpoint template uses bright colors to visually appeal to your audience, as a result, it will help them focus on the important information. Also, the bright colors in this presentation give an enthusiastic vibe to the presentation. 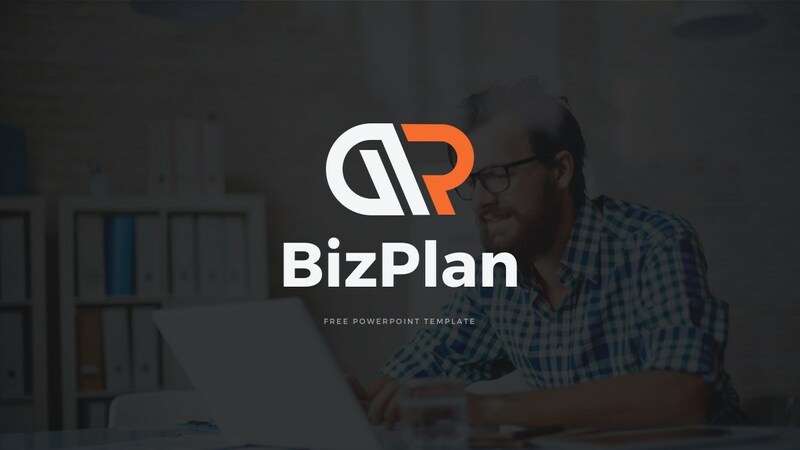 Bizplan is composed of 15 slides easy to edit slides that give you full control to edit anything to create your one of kind presentation. You can add and rearrange anything on the slides in a way that better presents your information. In fact, to make data more interesting and easier to understand, use infographics like tables, graphs, diagrams, ect. 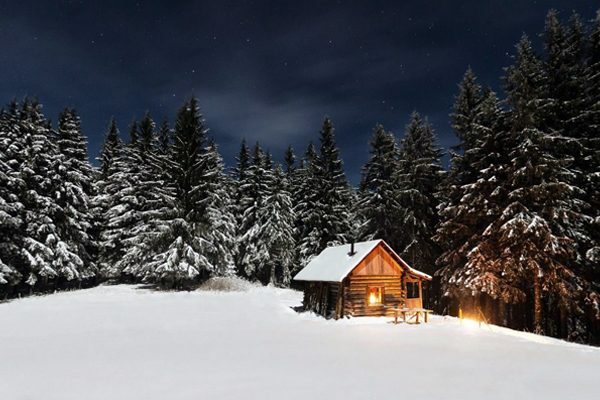 Similarly, you can use images to give the bigger picture of what you have discussed. 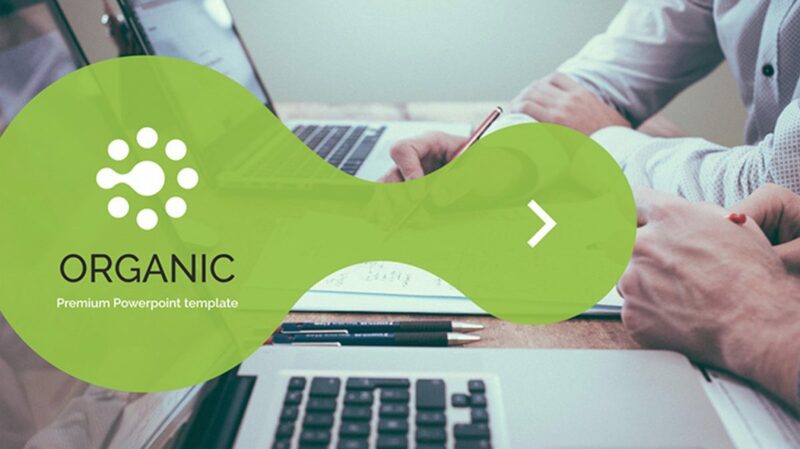 Air Minimal Powerpoint Template is a simple, clean, and organized presentation template that will leave your audience impressed. This eye-catching presentation is elegant and easy to follow along. As a result, you will deliver a clear message to your audience, while having their undivided attention. Simplicity is the best way to keep your information short, sweet, and to the point, to not overwhelm your audience. Having too much information on a slide can get boring, and result in losing your audience’s focus, which is why this is designed to have the minimal style. Just because you put the minimal information, does not mean you’re not giving the audience all the information they need. Science is a very popular school subject, but lectures can sometimes be boring and that makes it difficult to follow along, giving the audience a chance to daydream and lose focus. 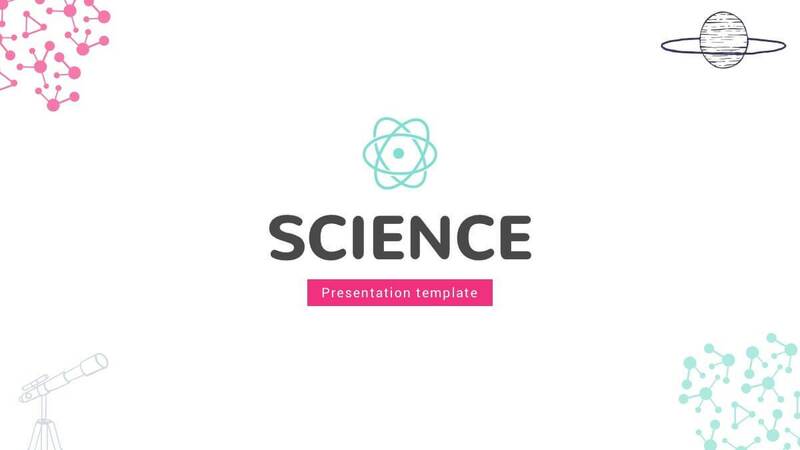 Capture your audience’s attention with a fun and creative presentation like the Science Powerpoint Template. 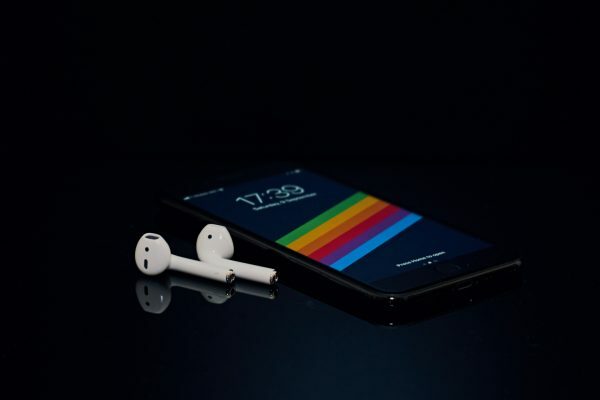 In fact, an effective way to make sure you have their attention is to appeal them to the presentation visually, by giving them something other than just words on a black and white screen to look at. If you have their visual attention, they are more likely to listen to what you have to say. 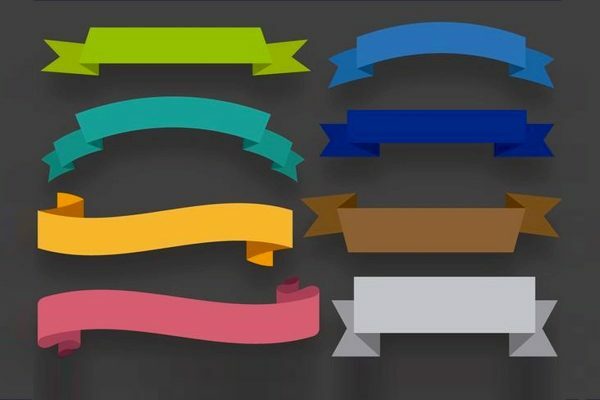 This presentation uses a soft combination of colors that make the information on each slide stand out, making this presentation more entertaining to look at. 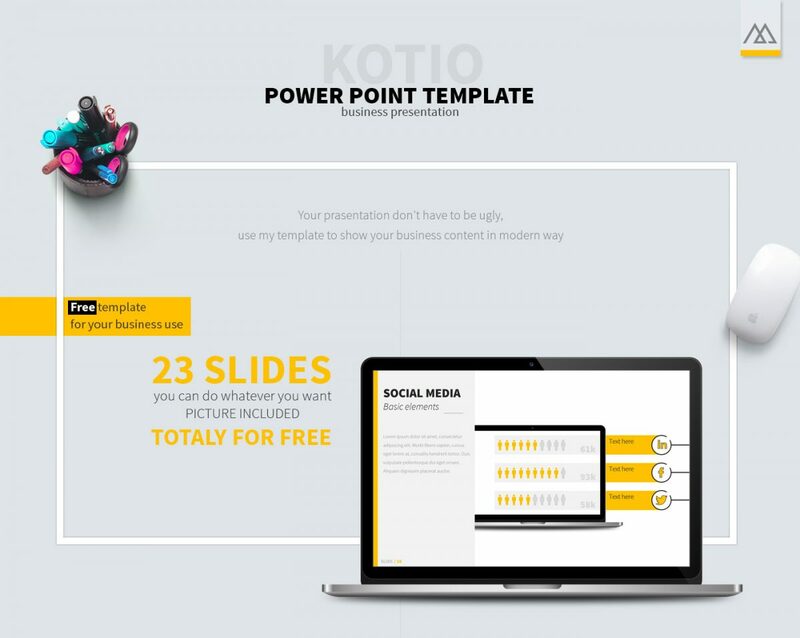 The Kotio Powerpoint Template is a great presentation template for professional presentations, like for a business report, company pitch, or corporate presentation. 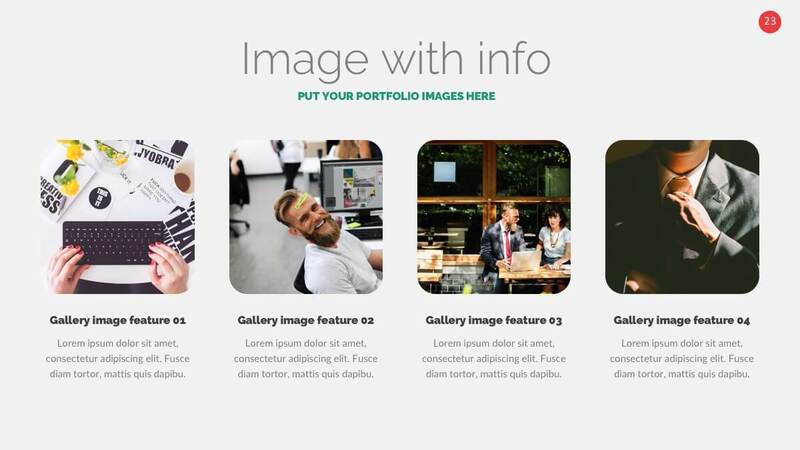 Kotio has a simple and clean slide layout, that will impress your audience with how professional it looks. You don’t have to be an expert at designing to create an impressive presentation. This presentation template is composed of 23 unique, clean, and organized slides that fully editable. Kotio is so easy to edit, that you will save a lot of time creating the presentation than if you were to have started from scratch. This presentation has all the elements you need in order to stand out and be able to give a clear and informative message. For a fun and creative presentation to capture a child’s short attention span, use the Kindergarten Free Powerpoint Template. 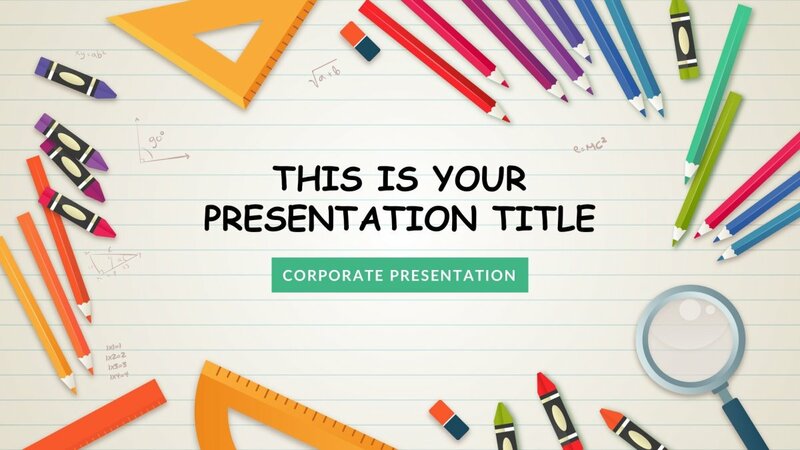 It is no surprise that children lose interest very easily, which is why this presentation template would be great to present to a group of children. 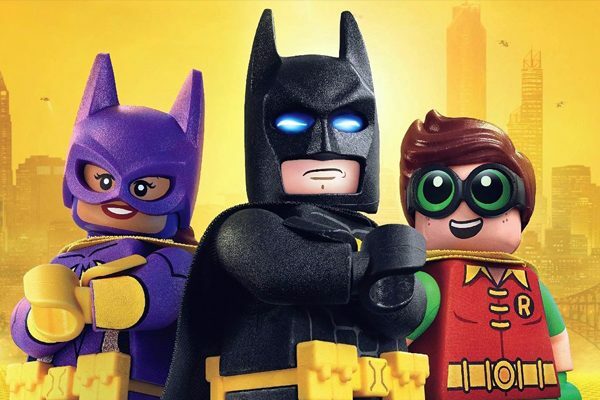 Throughout the presentation, there is a fair amount of color to attract the child’s attention to the screen, without causing too much of a distraction over what is being taught. Kindergarten is composed of 23 fully customizable slides that are easy to edit, whether you don’t the like the color scheme, want to rearrange the order, this is your presentation and you can do just about anything needed to make you presentation stand out. 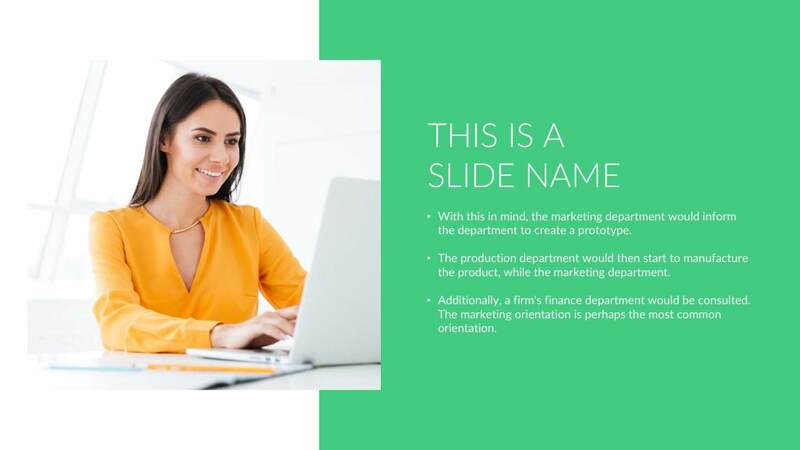 If you are looking for a minimal presentation that is entertaining, but not too boring to put the audience in a daze, then we recommend the iDesign Free Powerpoint Template. 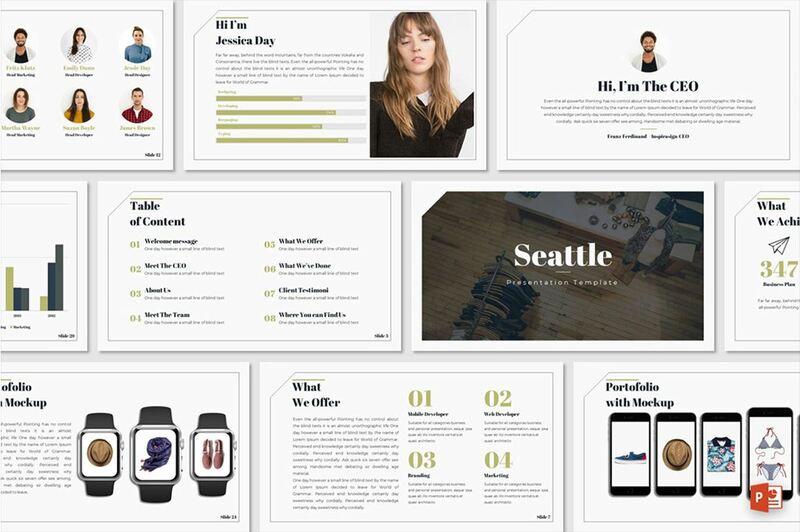 This presentation template is a creative, clean, and organized. iDesign has a minimal style keeping the information on the slides, short, sweet, and to the point. iDesign is composed of 24 ideal slides that will present a clear message to your audience. Giving the audience minimal information keeps people focused since they are not being overwhelmed with so much information, as a result, they will get a message that is short, sweet, and to the point. So, create an impressive presentation that is appealing and interesting. Yellow is associated with optimism and energy, so why not have a presentation that shows how positive and energetic you are? If you want that positive and energetic vibe in your presentation, then you should use the Yellow Free Powerpoint Template. This template is composed 24 unique and easy to edit slides. You have full control of the template letting you create the presentation you want. With the Yellow Powerpoint Template, you can visually capture your audience’s attention, apart from the yellow background, by adding images and infographics to give the audience something other than words to look at. Visual aids are great to help those who are visual learners to also get a clear message. 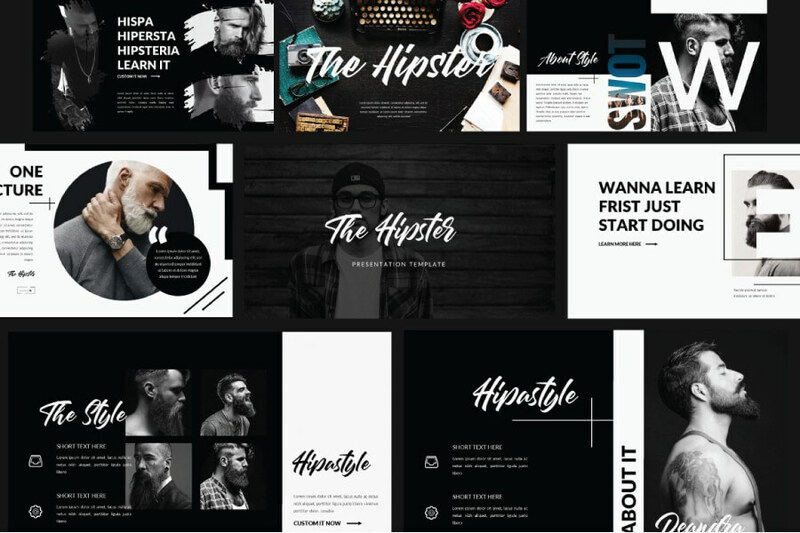 Hipster is a modern and minimal Powerpoint template that is multi-purpose, for you to use for any type of presentation and impress your audience. 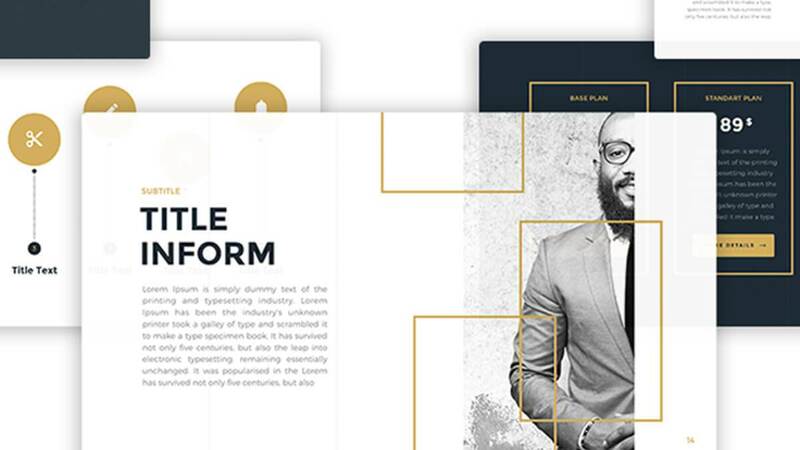 This one of kind presentation template is composed of 55 unique slides each with an impressive design and layout, that are fully and easily editable. As a result, you have full control over how you want to present your information to the audience. 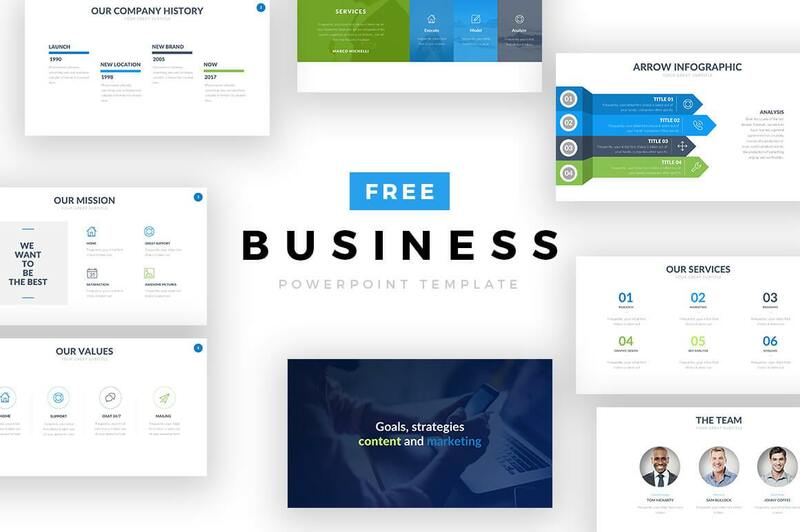 If you want a clean, simple, and modern presentation template, then the perfect presentation template for you would be the Arina Free Powerpoint Template. The simplicity of this presentation, give it an elegant and professional look. 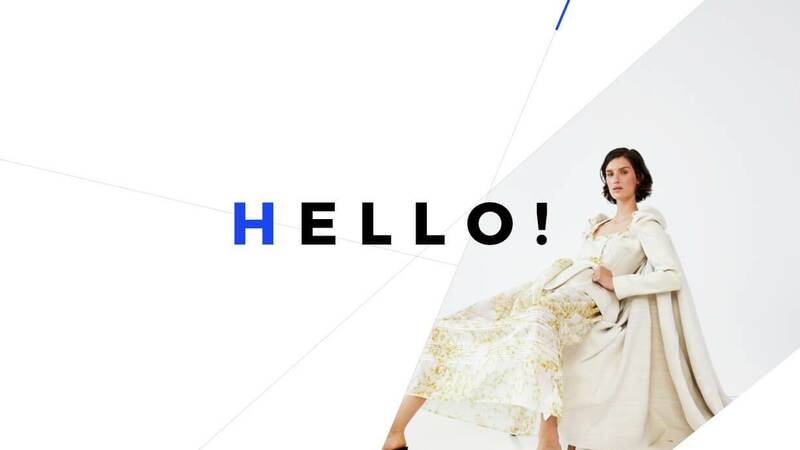 Impress any potential clients, co-worker, employers, or even classmates with this impressive Powerpoint presentation that will make you stand out. 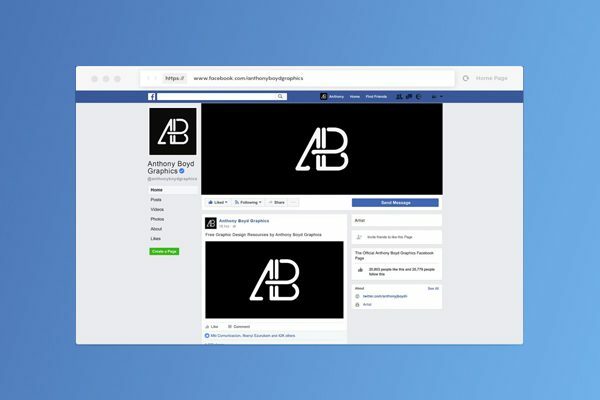 Social Media is what society is focused on, so this presentation template uses a design that will capture that audiences attention, like social media does on a regular basis. 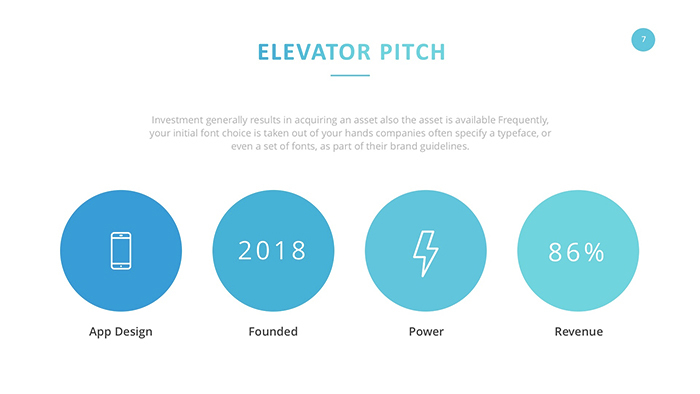 Giving a pitch to a company or business can be nerve-wracking, which is why the Startup Pitch Deck was designed. This presentation is organized to have clean slide layouts to present your information in the most effective and impressive way. 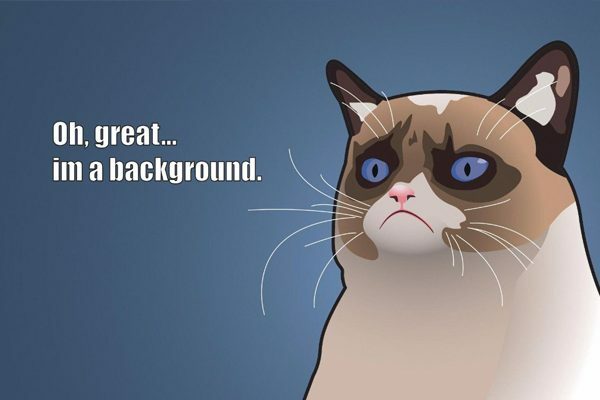 Your information will stand out with the colors used and the visuals will enhance your audiences’ attention. 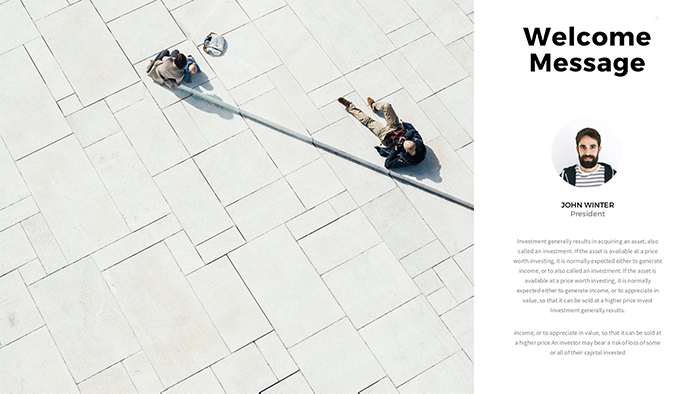 If you are looking for a presentation template that is fully editable, simple, with a minimal style, yet is very elegant and professional, then you have just found the perfect presentation template, Market. Market is perfect for any type of presentation, whether it be for personal or corporate use. In fact, this presentation will give your audience a clear and informative presentation. Company Profile is a colorful and creative Powerpoint presentation that is sure to make all your important information stand out. You can impress your audience with its clean and organized look that will give them a clear message that is easy to understand. 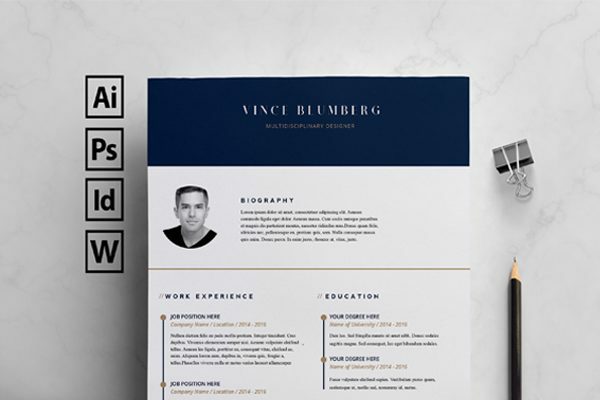 A Company Profile is important to any business, so this presentation template was created to make it easier for you to organize and get your important information out to your audience. 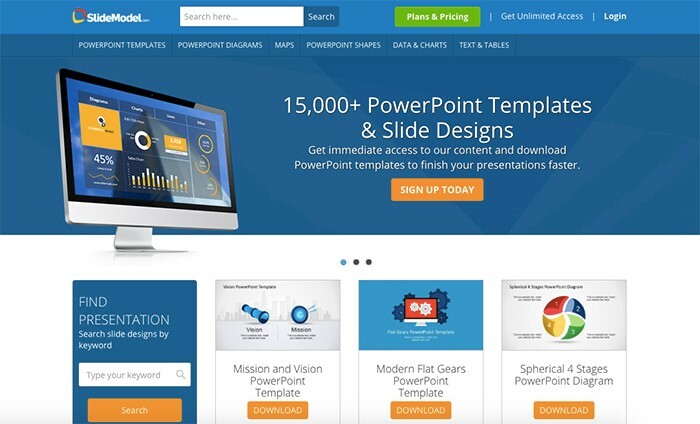 Are you looking for the perfect Powerpoint presentation? Then look no further. 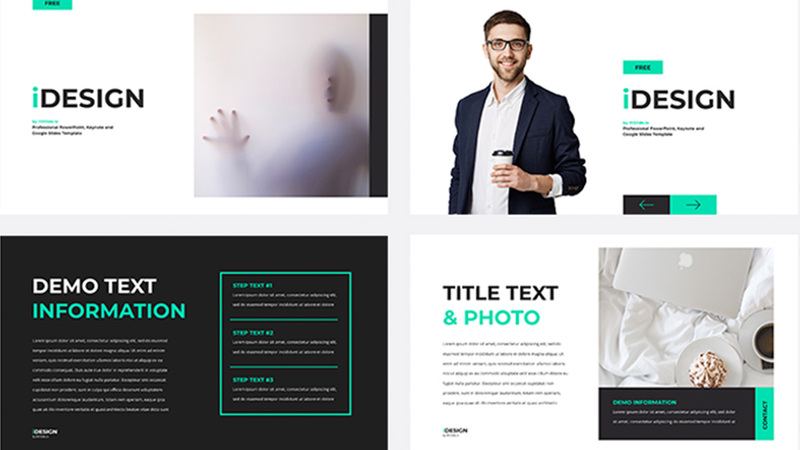 Epsilon Powerpoint Template is a creative and multipurpose presentation template, perfect for any presentation. You have over 7,000 slides to use, 117 color options, and 500 icons. Since this presentation is fully editable, that means you have an unlimited amount of ways to organize your information. 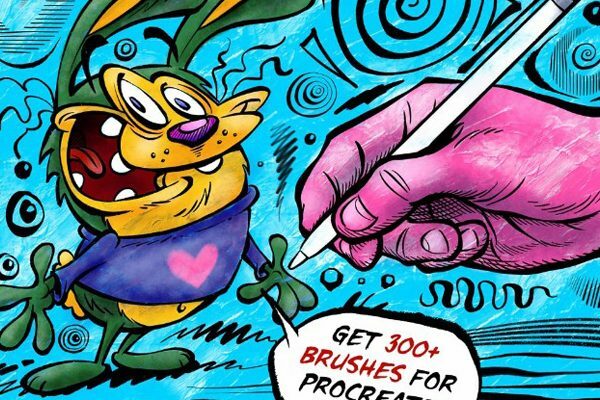 Wow your audience with your creativity, and show them what you are fully capable of. Do you want to just get your message out, or do you want to give a successful, impressive, effective, and informative presentation? With the Modern Presentation Template, you are sure to get your point across while having your audiences undivided attention. 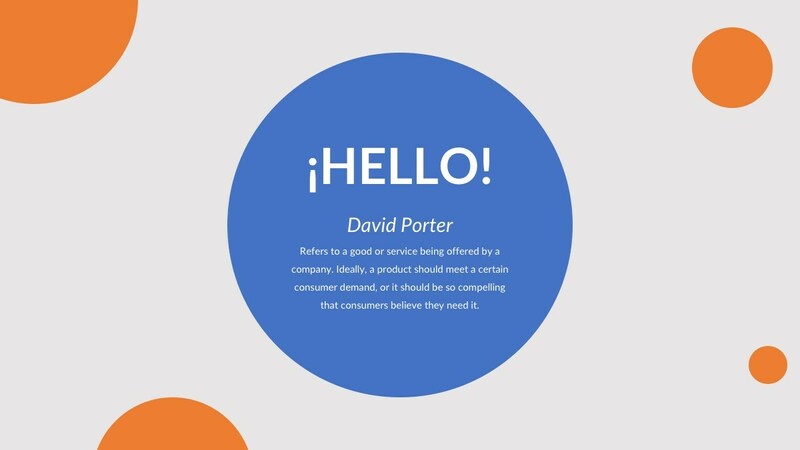 So, why not make your presentation visually appealing using colors. This presentation is easy to edit, so you can create an outstanding and beautiful presentation. Don’t settle for boring when this presentation is just for you and what’s even better is that it is 100% free. 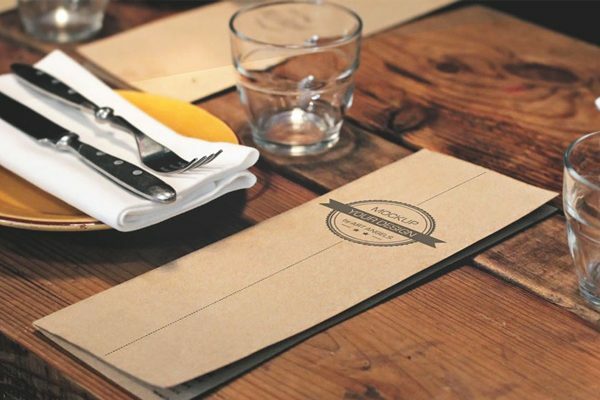 SImplicity is an elegant and simple way to present to a diverse audience. Just because something is simple, it does not mean it is boring. Simple Powerpoint Template is a modern and stylish presentation template that is sure to make a significant impact and get a powerful message across. This presentation has a minimal style, keeping your information short, sweet, and to the point. Technology is a creative and modern presentation template with a unique and impressive design. This presentation template uses an electrifying blue color that gives the presentation a calm and cool feel. Do you know what adjectives are associated with the color blue? Well, blue is associated with knowledge, loyalty, and confidence. 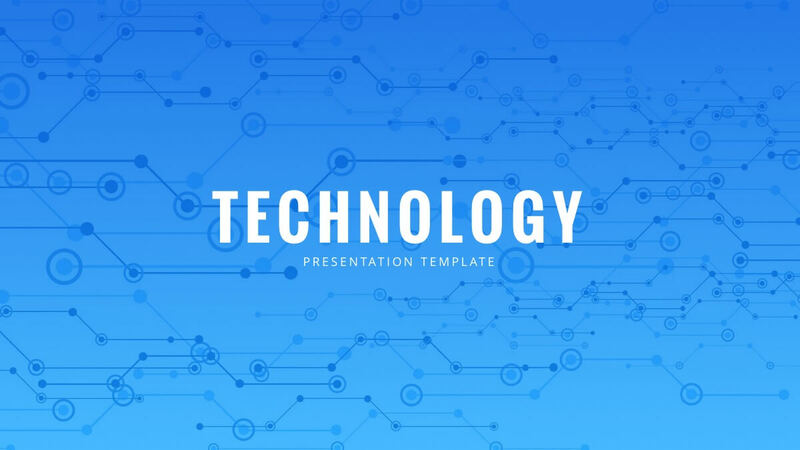 Demonstrate your knowledge of the business, show your loyalty, and present to your audience with confidence using Technology Powerpoint Template. 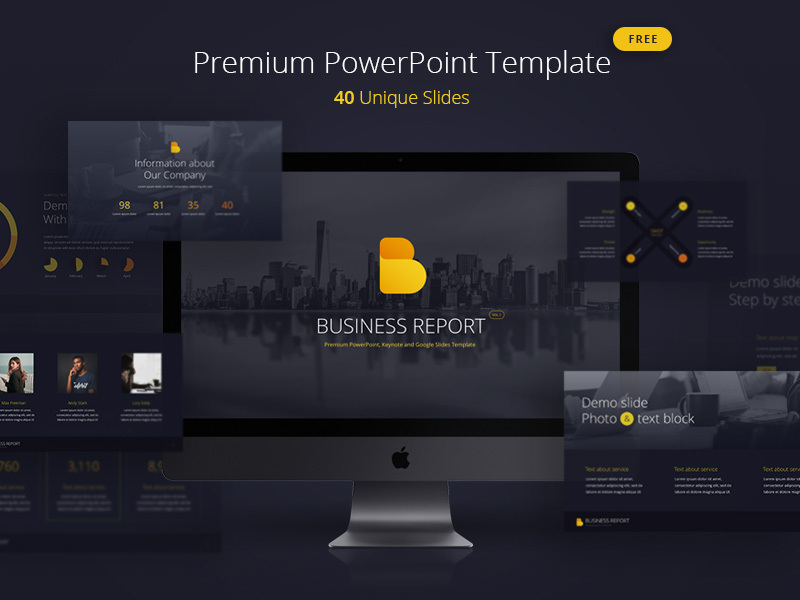 If you want an enthusiastic presentation that shows you determination for success, then the perfect presentation template would be the Business Market Powerpoint Template. 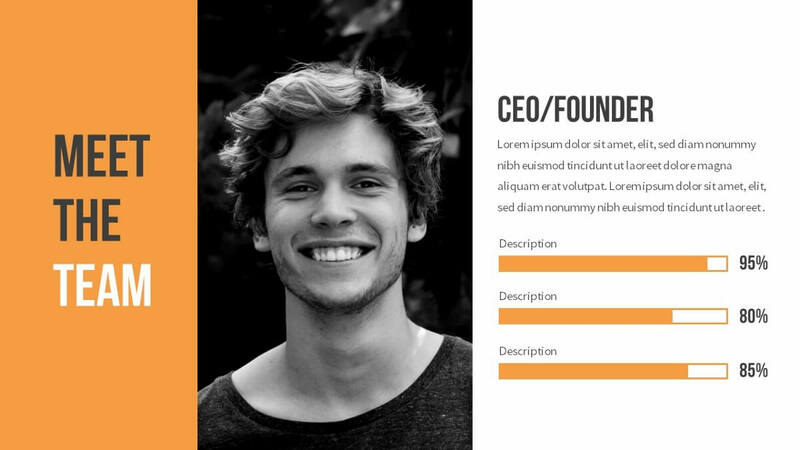 This presentation template uses a bright orange color that is sure to capture your audience’s attention in any presentation, whether it be for a company profile, business pitch, or report. Presenting to an audience about business with this presentation will make it more interesting. 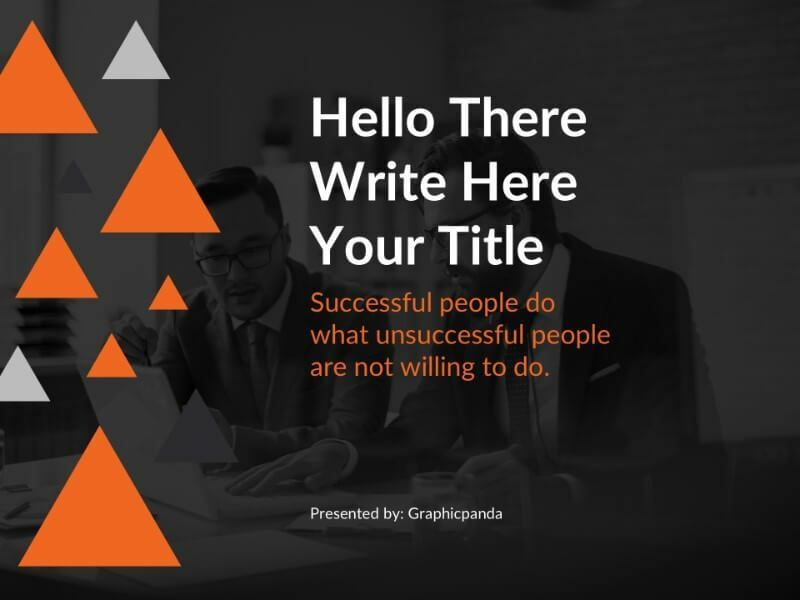 If you are looking for a presentation template to present to an emotional group or you just want to influence people in a positive way, then use the Inspirational Free Presentation Template. Inspirational is composed of 6 unique slides, that can helps capture the audience’s attention and help them engage in your presentation. 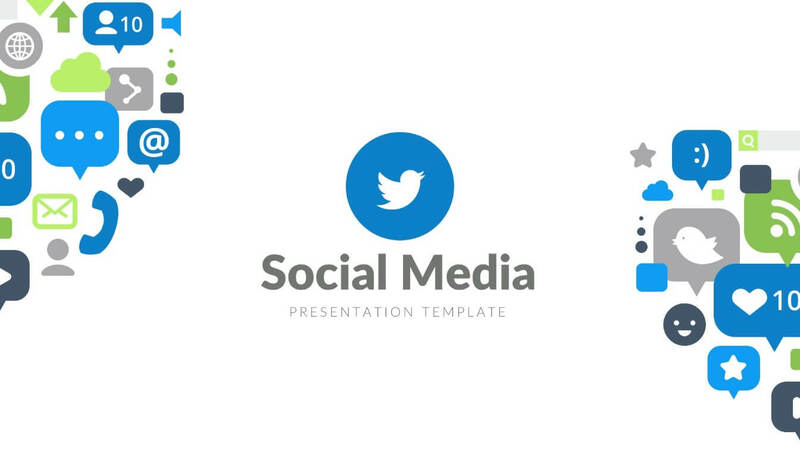 For an innovated presentation template that is professional, you should use the Social Media Free Presentation Template. 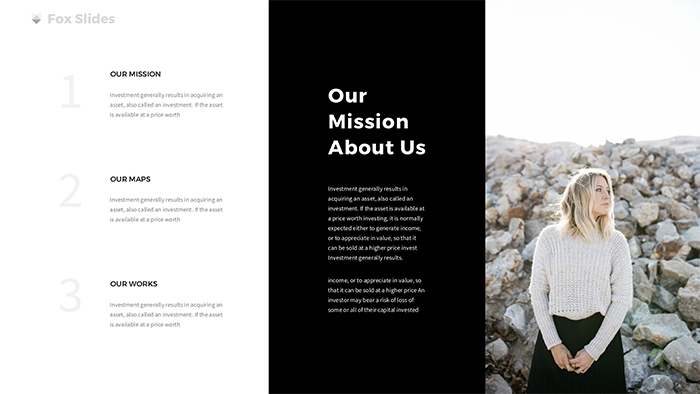 Since it has clean and organized slides, this presentation template is easy to follow along and get a clear message. In fact, the layouts follow a minimal design. 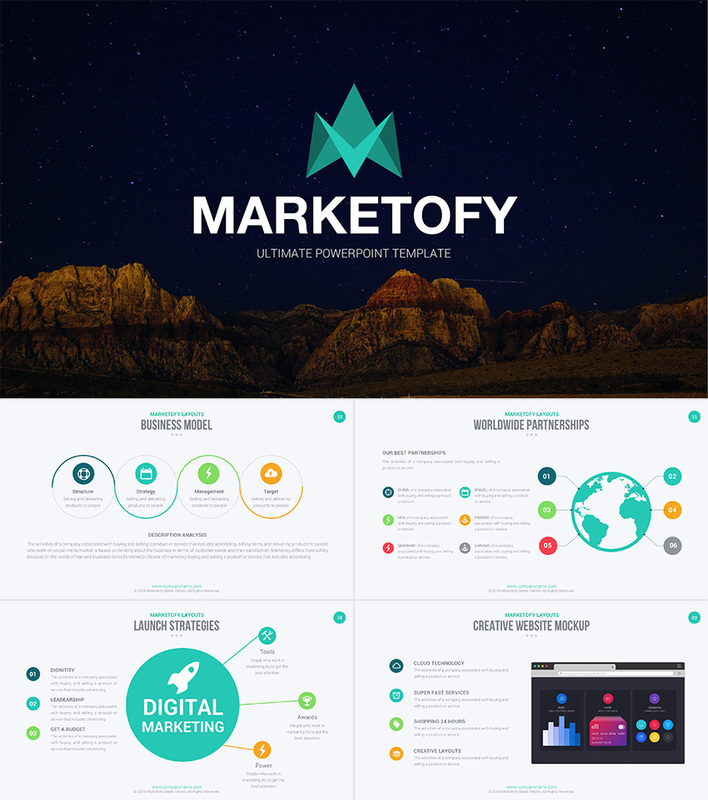 As a result, this presentation template is visually appealing, with great infographics, and social graphic designs. 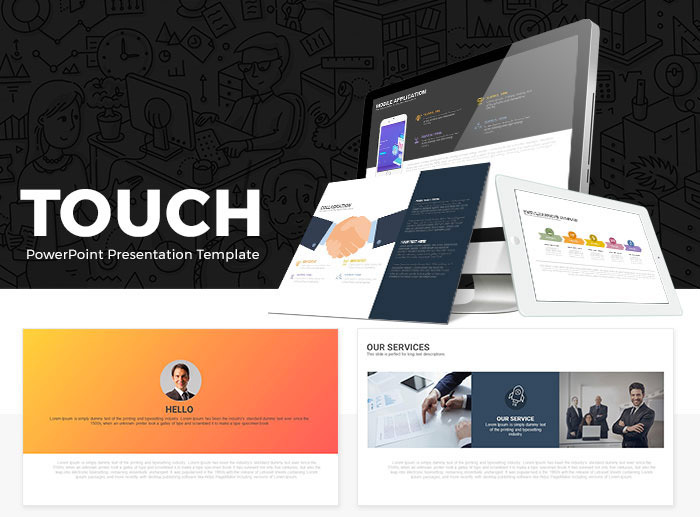 If you want a multi-purpose Powerpoint template that is colorful and creative, then use the Touch Free Presentation Template. 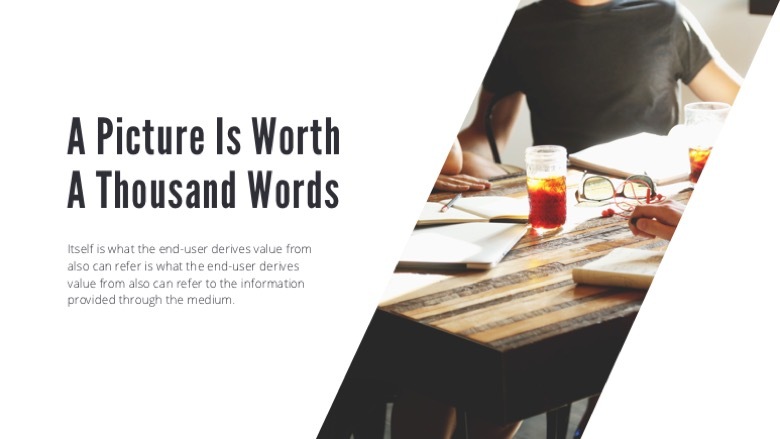 This presentation provides various infographics for you to edits, easy to edit slides and an organized layout that makes it easier for your audience to follow along and get a clear message. This presentation can be used for personal and commercial use, it does not have a specific use of presentation. 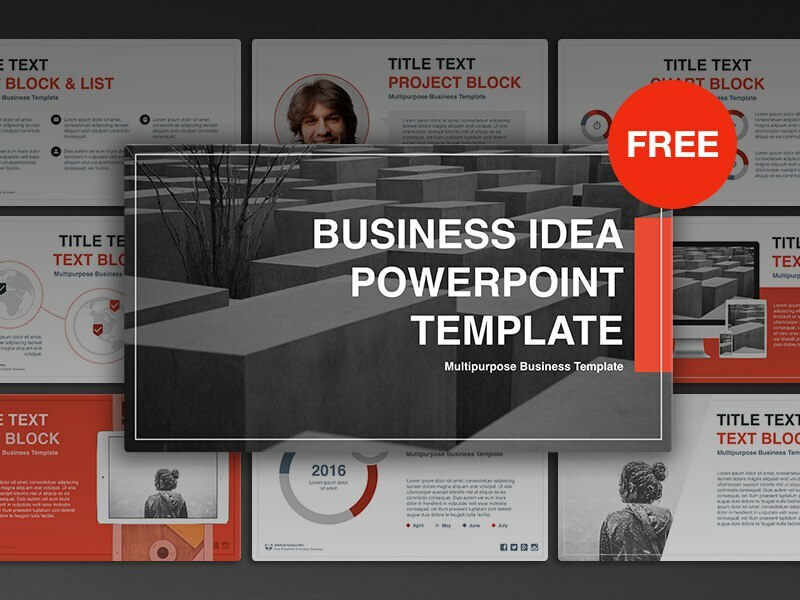 Presentations about business can sometimes be boring, but with the Business Idea Powerpoint Template, you can create an appealing presentation that will impress your audience. In fact, it is simple to edit, and with a click of a few buttons, you can change the color of the presentation. Adding color to any presentation makes the presentation visually appealing to capture the audience’s attention. Add all your information and voila! Simplicity can help you present any information in an effective and professional way, which is why the Clean Powerpoint Template was designed. This template helps you give a straightforward message that is easy to follow. The subtle hint of color helps information stand out and visually grabs the reader’s attention to focus on the information being presented. 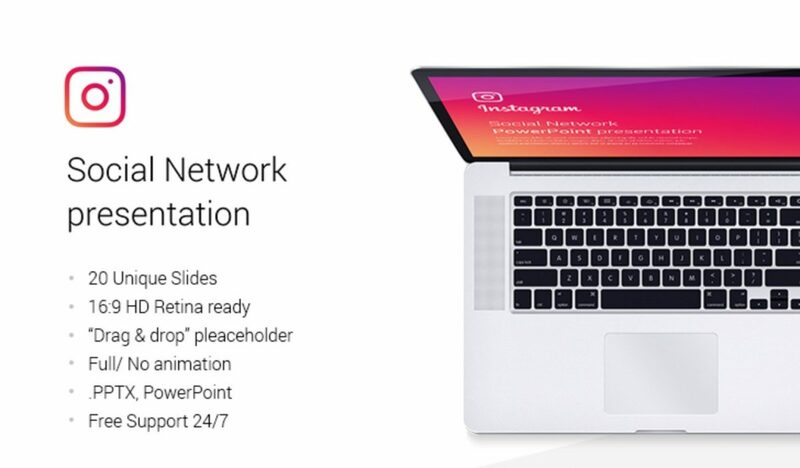 If you are looking for a presentation that is fully editable and ready for you to customize, then use the Dorna Free Powerpoint Template. This trendy and creative presentation comes in two different versions for you to choose from, whether you want a dark version or a light version for your presentation, you have full control to give it the look you want. Impress your audience using this creative and well-designed presentation. 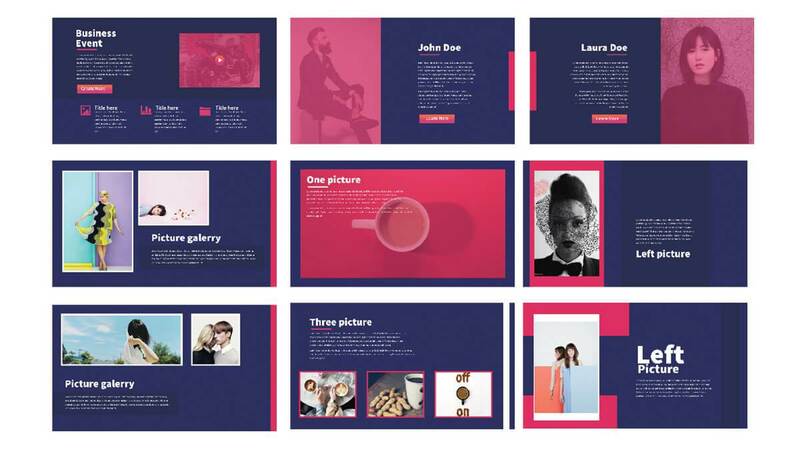 If you want a minimal style presentation template, that uses bright colors to capture the audience’s attention, then you should download the Pastel Free Presentation Template. 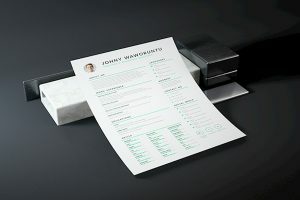 Pastel uses a modern and unique design that is clean and organized, making it perfect for any type of presentation. 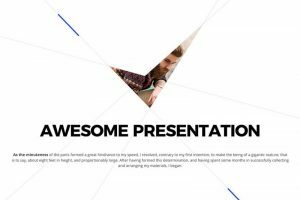 This presentation template is multi-purpose meaning you could use it for personal and commercial presentations. Creating a beautifully done and professional presentation has never been easier. 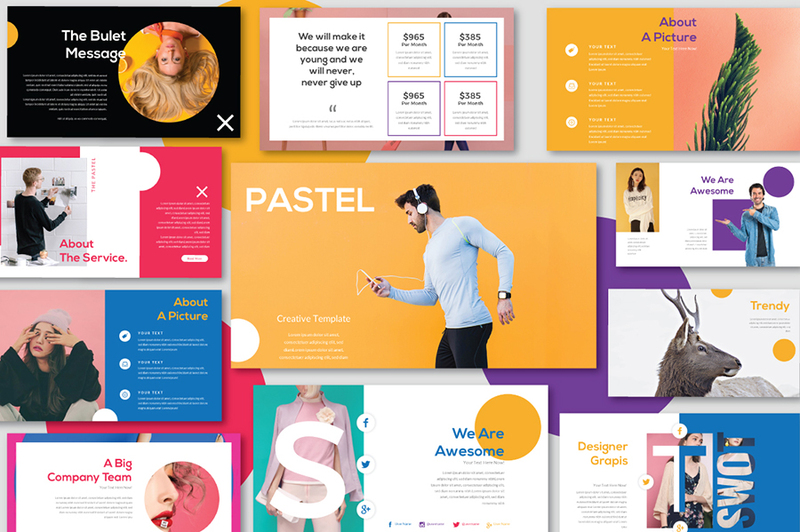 Since the Pastel free template has already been created, you don’t have to waste your trying to figure out where to even start creating your presentation, because we have already provided one for you. So, go present to your audience with confidence, and stand out from every other presentation. 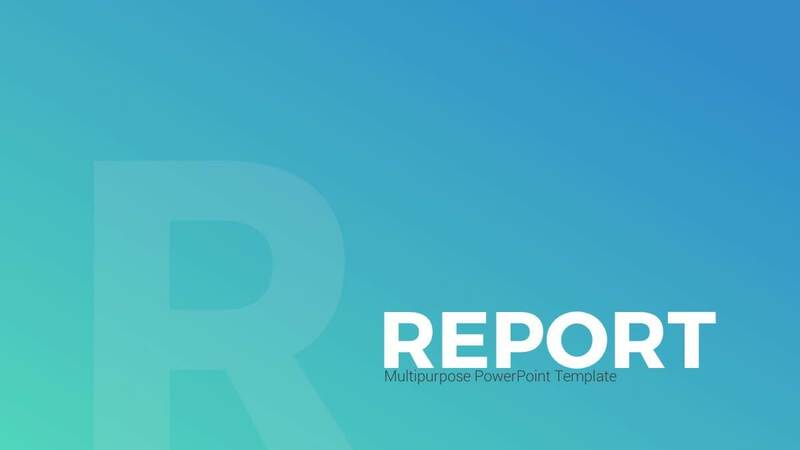 For a Powerpoint template that is perfect to use with RTL texts, suitable for Persian, Urdu, Arabic, and many more, then we recommend you use the Salam Free Powerpoint Template. 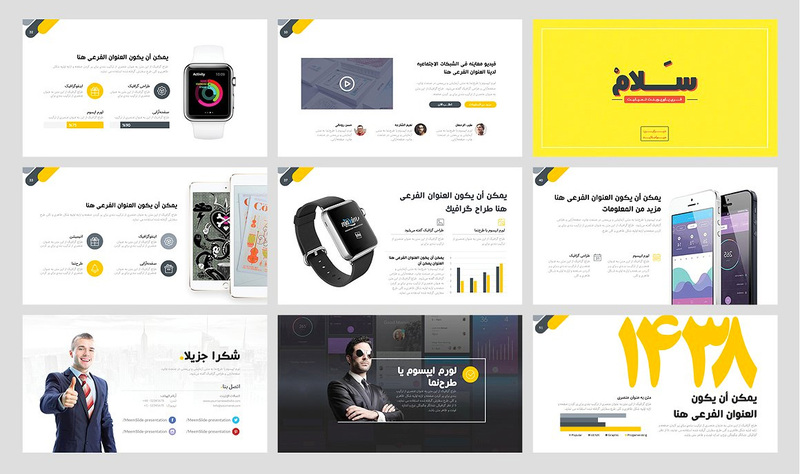 Salam is a colorful and creative presentation template that will make any presentation stand out. In fact, when you get Salam, it includes 14 different color themes and many more features that will enhance your audience’s attention to the presentation. 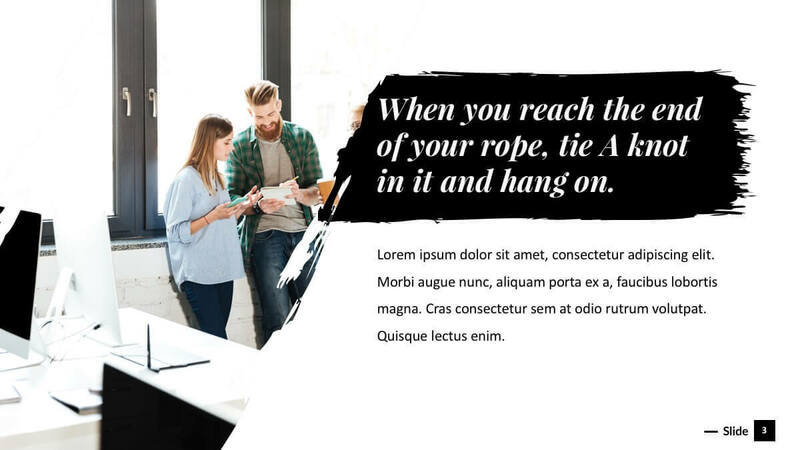 There are not many templates that work well with the RTL texts, which is why this is the perfect presentation template to use if you need a presentation template for RTL text. So, don’t let the type of text you are using affect your presentation, stand out, impress your audiences with this one of a kind presentation. 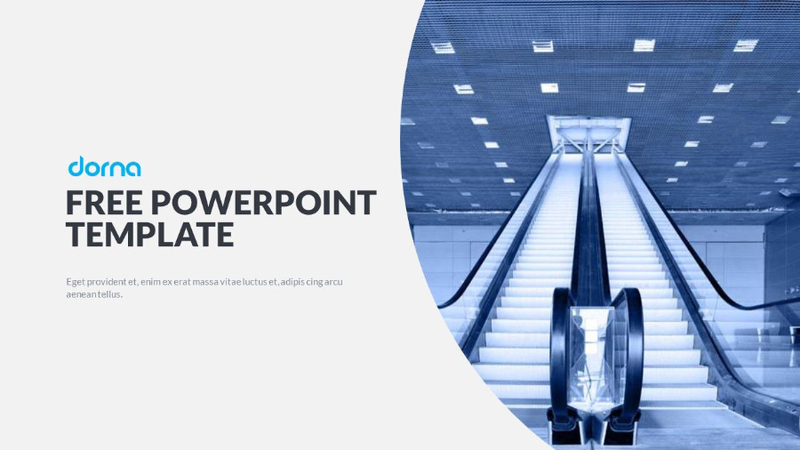 For a powerful, yet minimal presentation that is modern and eye-catching, use the Minimal Free Powerpoint Template. 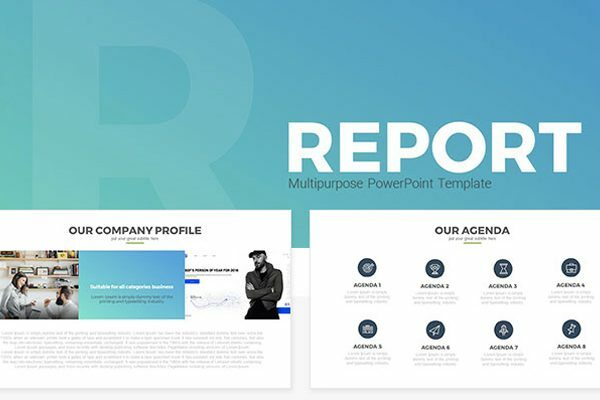 This presentation template is multipurpose, making it the perfect presentation to present to a creative company, business, school project, restaurant, etc. In fact, this presentation template is easy to edit, and you can customize it however you feel your information will stand out better with your audience. 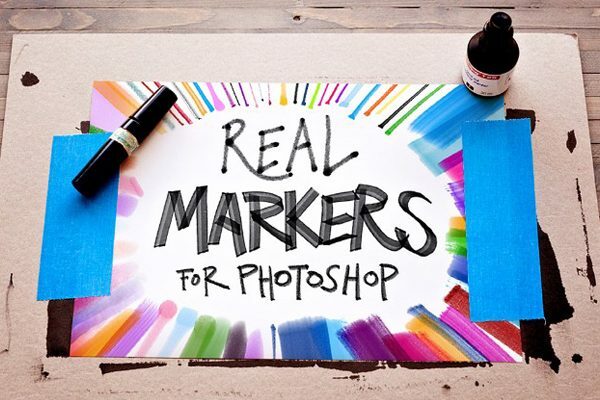 No more spending hours trying to create the perfect visual demonstration. As a result, this presentation won’t only impress your audience, but it will also impress you with simple and easy it is customized and put in all your information. At the end of the day, you will be able to present with confidence knowing your presentation will capture your audience’s attention. 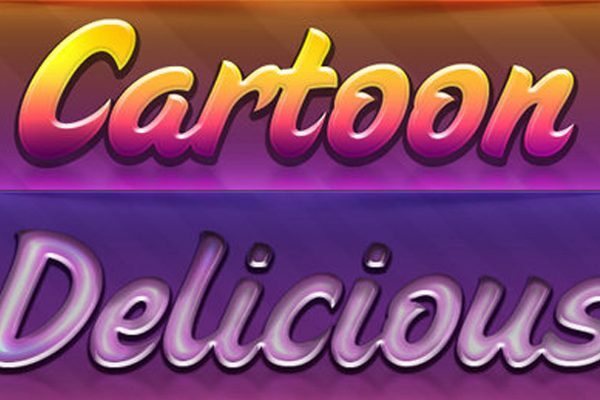 On these sites, you can get these themes instantly, without registration. 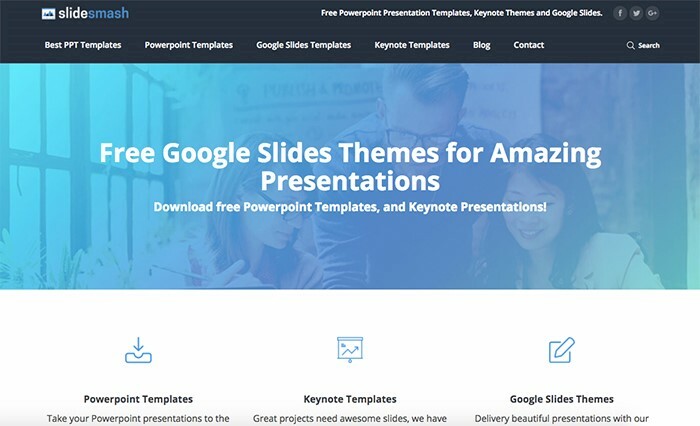 Whether you are pitching investors, share new ideas with your team, or making a review of a new product, these sites will help you to find a perfect presentation template. 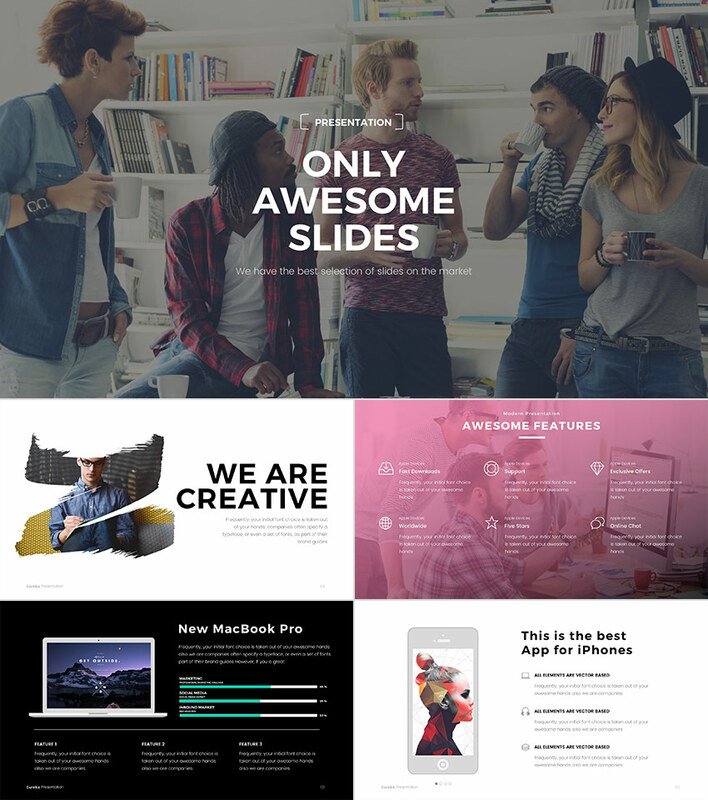 SlideSmash is a website with hundreds of presentation templates of any kind. You will find both free and paid templates here. 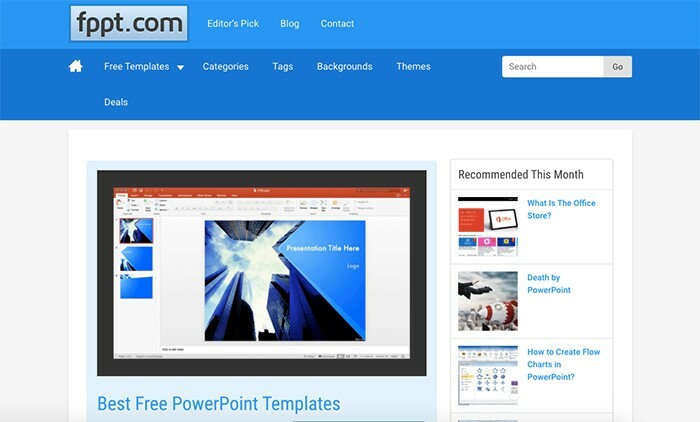 Just go to the PowerPoint section of the menu, and you’ll see various collections of templates, such as Best, Business, Marketing, Clean, Mind Map, and more. 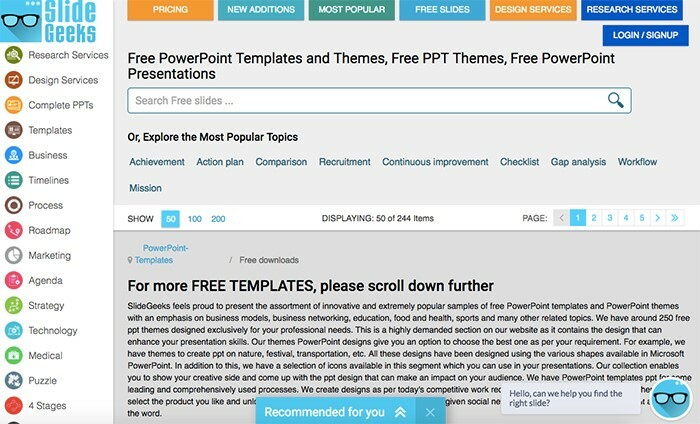 FPPT is a quite popular and old website including over 3,000 presentation themes. You can download any template without registration in a Zip file. Besides, you can use tags to find what you need. 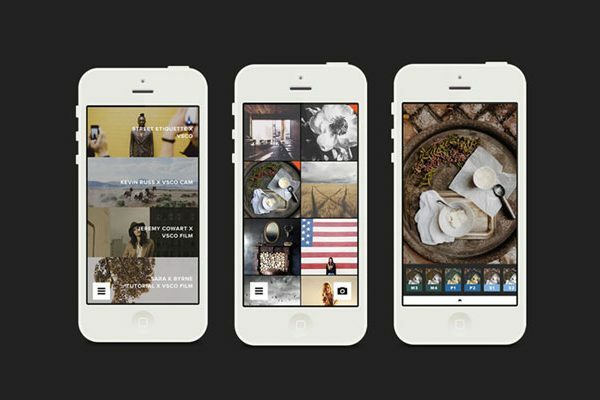 This site has a big collection of presentation themes for business professionals, as well as, creatives. You can browse different site categories, such as formal, inspirational, creative, simple, startup, elegant, playful, and business. 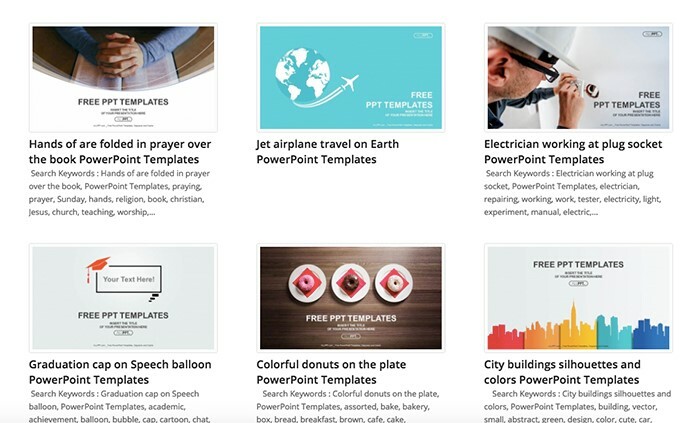 This is the best way to choose a free PowerPoint template for you. 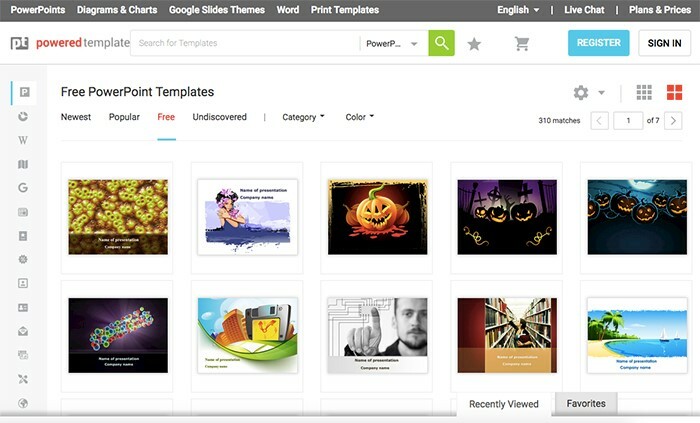 On GraphicPanda you are going to find free Powerpoint templates, Keynote templates, and Google Slide themes. You will see both free and premium options. 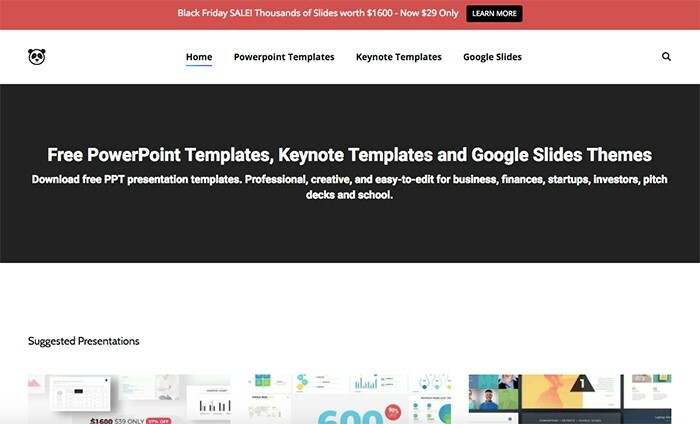 Also, they collect the best presentation templates bundles and deals on the homepage. SlideModel is a well-known site featuring professional modern free Powerpoint templates for business, marketing, finances, and other serious purposes. But you should be careful because a user has a download limit for a day there. SlideHunter is a trademark for Microsoft. They have over 4000 press presentation templates on the site. All the presentations have 16:9 ratio which means they will look perfect on a projector screen. 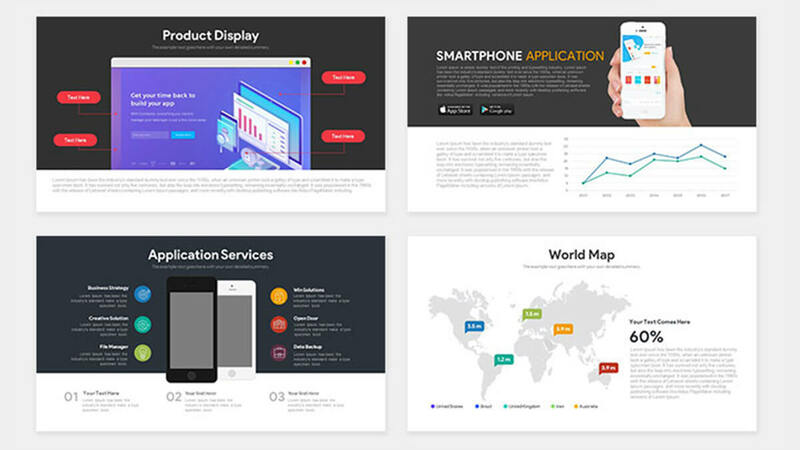 PPT Template site has loads of cool creative presentation templates to choose from. 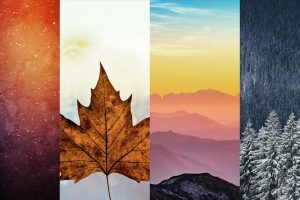 You can pick the template using the following categories: food, medicine, music, lifestyle, abstract, animals, education, sports, technology, and more. 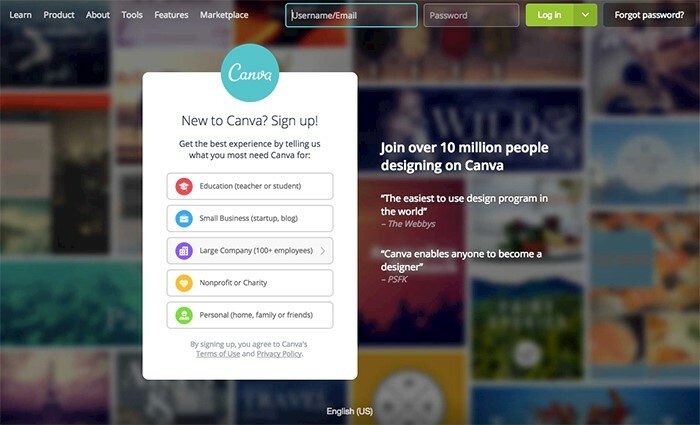 Canva is an excellent website allowing you to create and edit your presentations, social media covers, postcards, business cards, logos, and more. 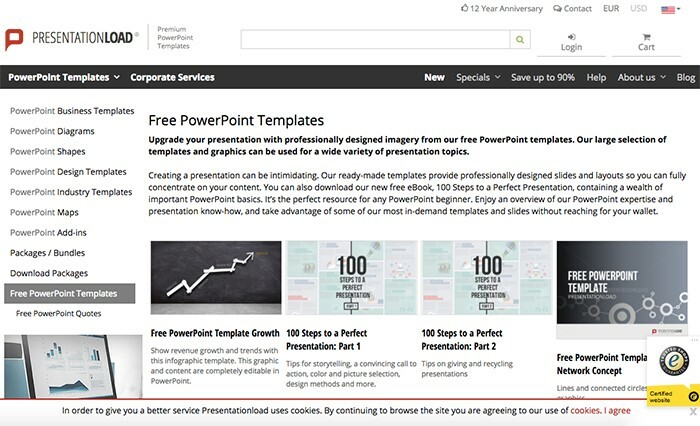 Just pick one of their presentation templates, edit it, and download in a proper format. 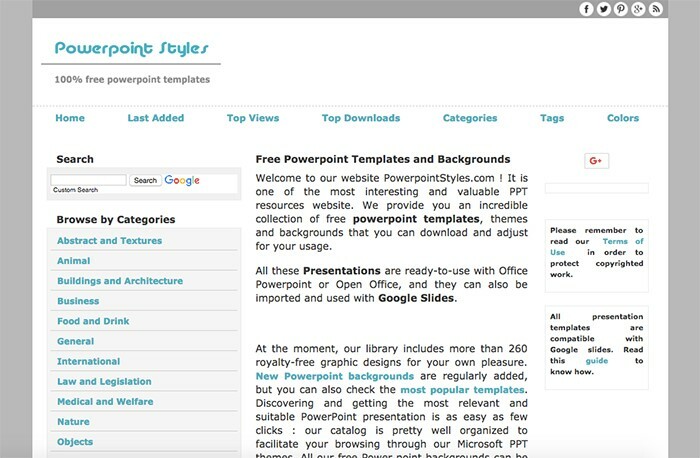 Powerpoint Styles has several hundreds of PowerPoint presentation templates and backgrounds you can get free. Just click the ‘Download’ button. 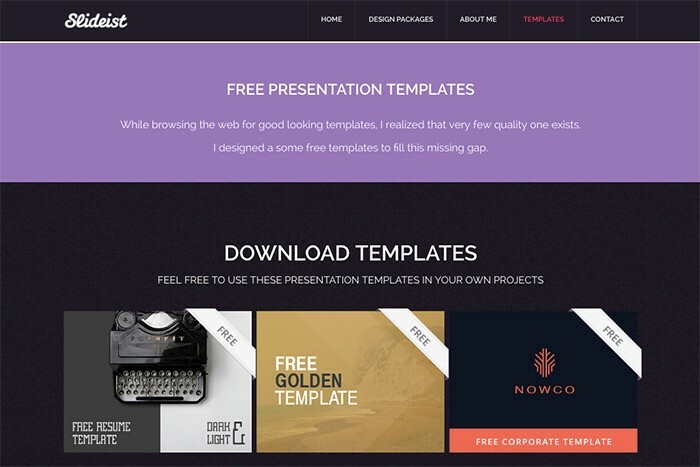 Just like the name says, this site features free presentation templates. You can download a well-organized neat template for any occasion, would it be an education project or business proposal for investors. TemplatesWise will bring your story into the spotlight with one of the hundreds of presentation templates. They have a few categories such as general, business, finance, nature, and travel, so you can browse them and choose the theme you need. At Powered Template, you will find perfect attention-grabbing PowerPoint presentation templates. You can choose a template from many categories, from newest or popular tabs, and also find it by a certain color. This site has hundreds of beautiful free Powerpoint templates and millions of nice slides. You can also download shapes, diagrams, maps, and add-ons. 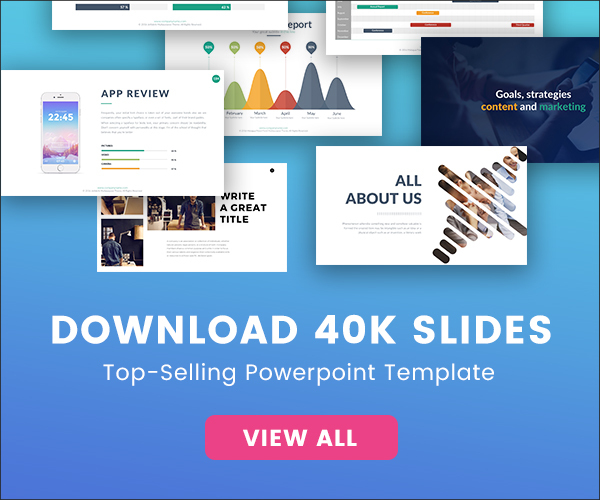 Slidemart has lots of high-quality modern, stunning free presentation templates. If you are tired of all these old ugly templates from 19995, this site is here to help. 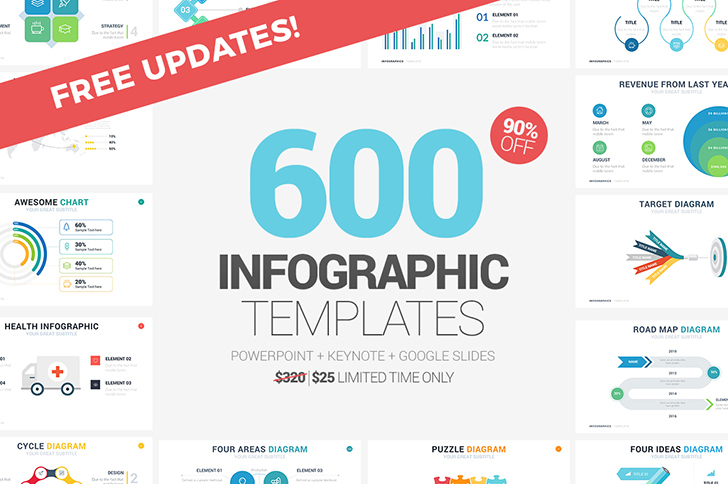 You will find free powerpoint templates for any taste here. 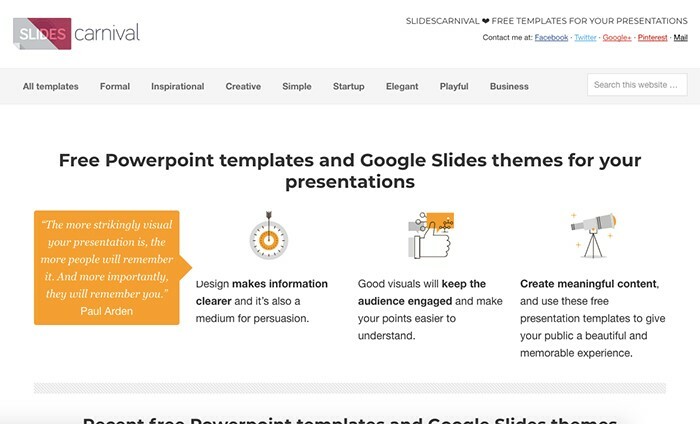 Just scroll down the site to see more free presentation templates and choose the one you like. 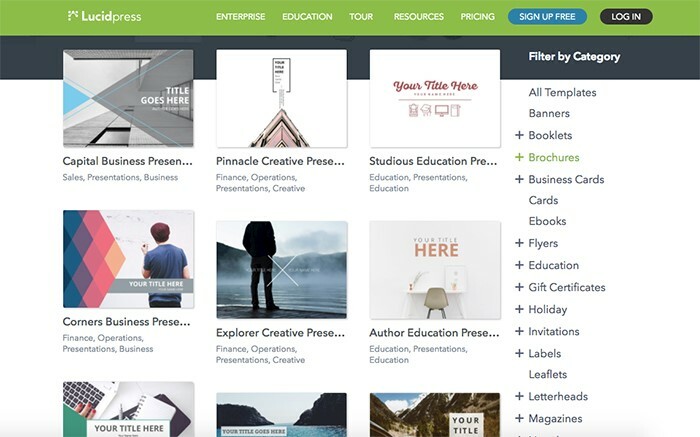 The left sidebar will help you browse the categories, such as timeline, business, roadmap, agenda, strategy, technology, and more. 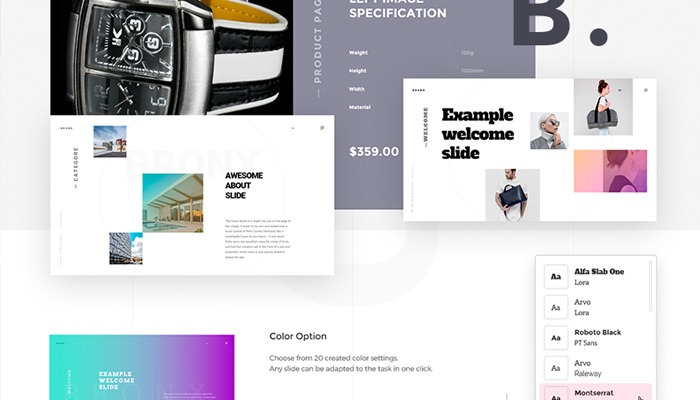 StockLayouts has a lot of various templates to offer. Along with presentations, you will find free brochures, flyers, business cards, menus, newsletters, postcards, and more. 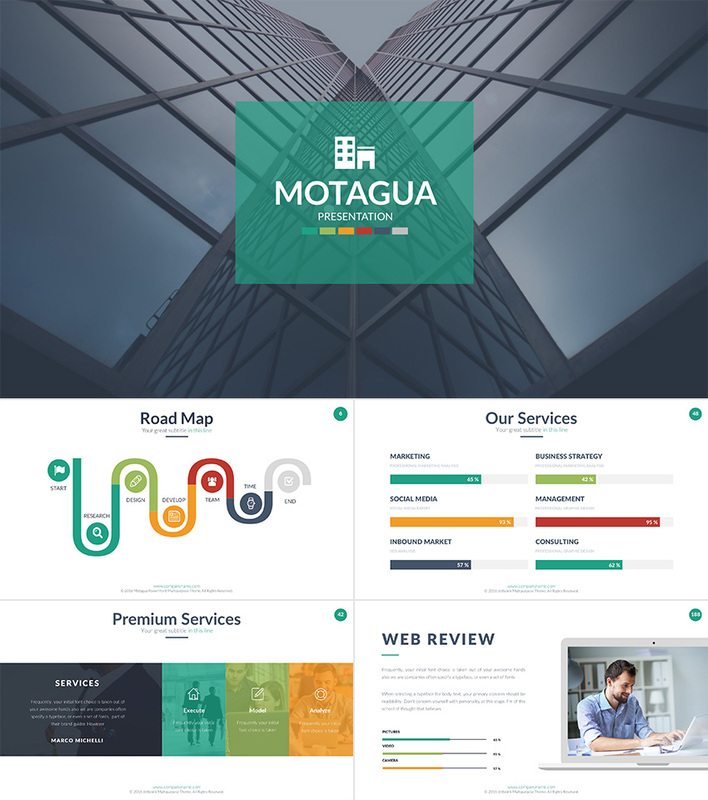 If you are looking for colorful, stylish presentation templates for your business, here you will find them. Slideist will help you present your message like a rockstar. 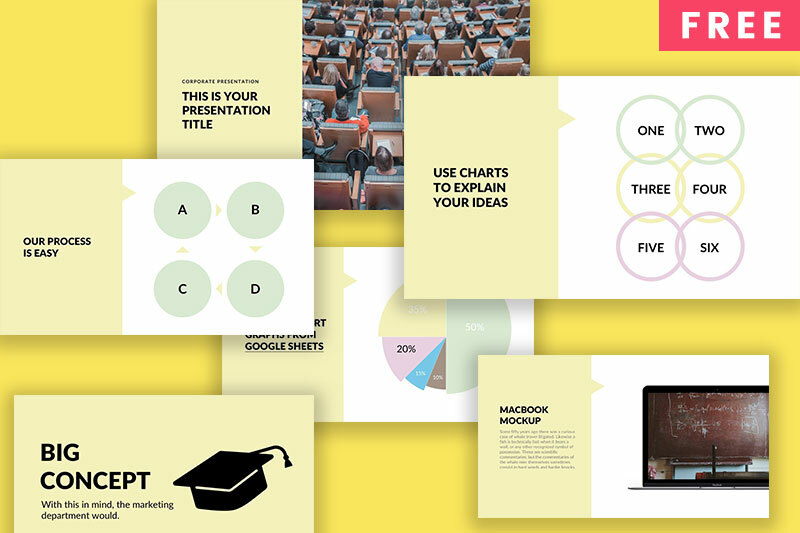 Here are some important cool presentation templates for education are listed. You will see both illustrated and image-based templates. 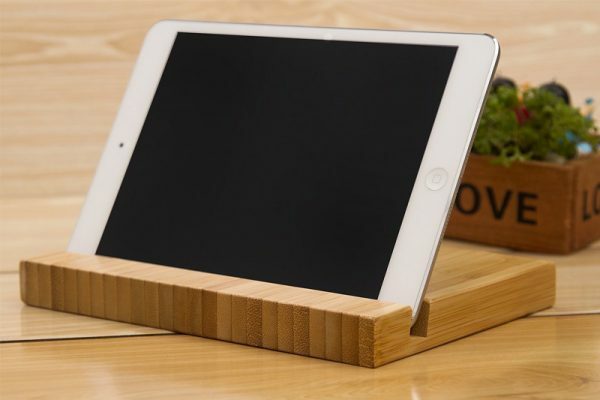 Leawo will help you create a gorgeous slide desk. You will find religion, Halloween, and even Labor Day templates on the site. This site is one of my favorite on this list. 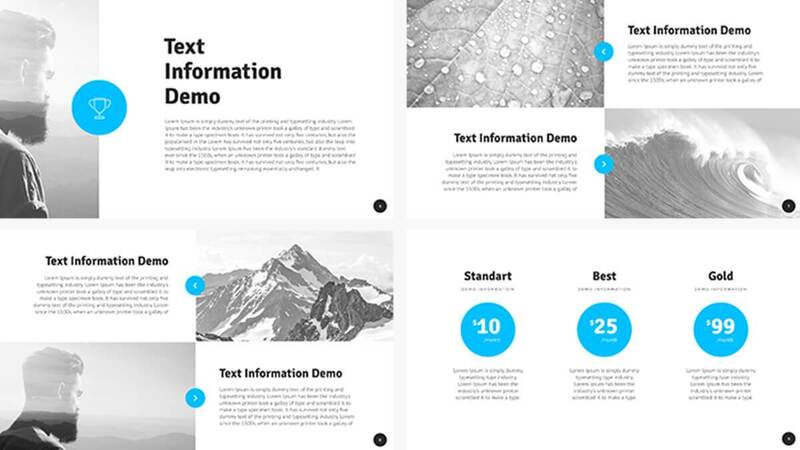 It features only fifteen free presentation templates, but all of them are modern and dynamic.